Tromso – the sun trying to break through. Longyearbyen – on the road to coal mine number 7, the only one still being worked. Two days in Tromso to get accustomed to the midnight sun, then 3 days in Longyearbyen, the most northerly permanently inhabited place in the world. They say midnight sun but we have yet to actually see the sun. It is light all “night”, very light but the hills around are permanently swathed in low cloud. 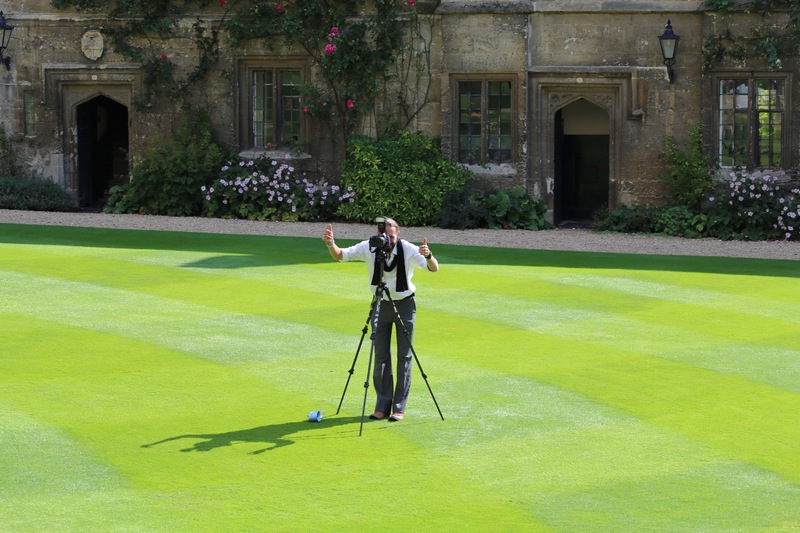 Today, our last day, we are forecast for some sun. We’re sailing north to Pyramiden, an abandoned Russian mining village, which will look even more dramatic if the sun appears. 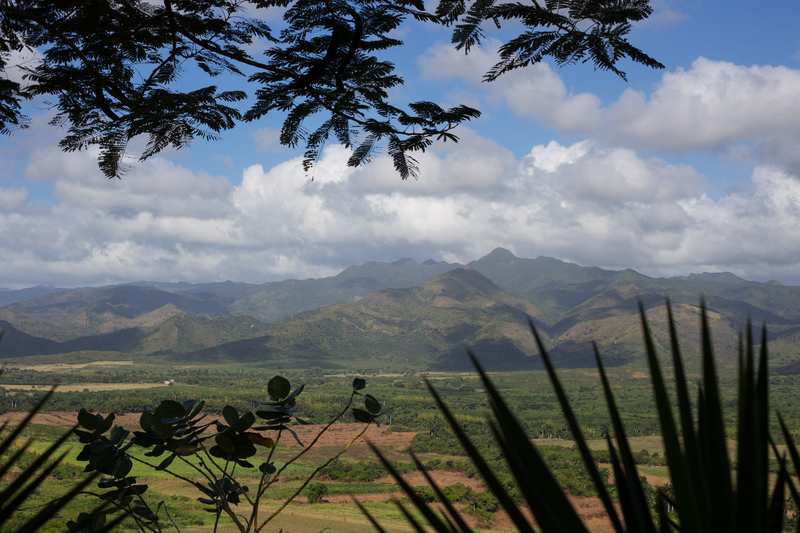 Trinidad is very different now from its heyday during the height of sugar cane production in the surrounding valleys. 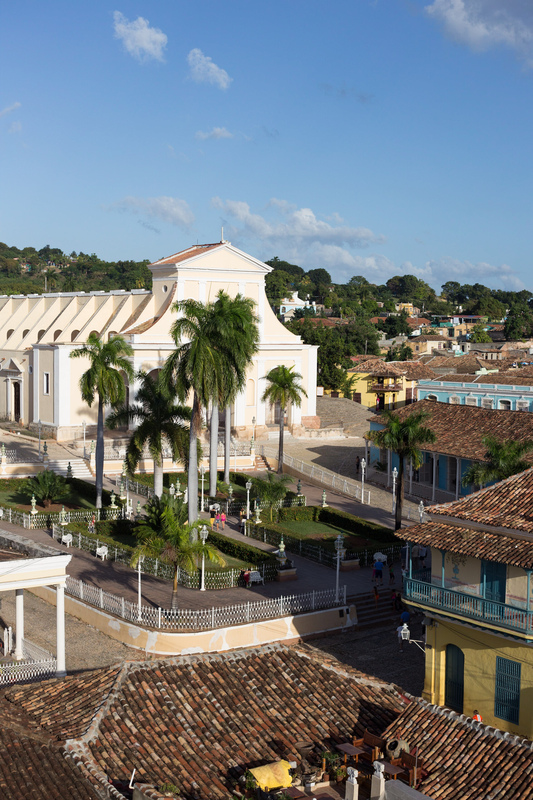 It is now a UNESCO site and much of its building stock is being restored albeit slowly and there are museums on archaeology, colonial architecture and history. 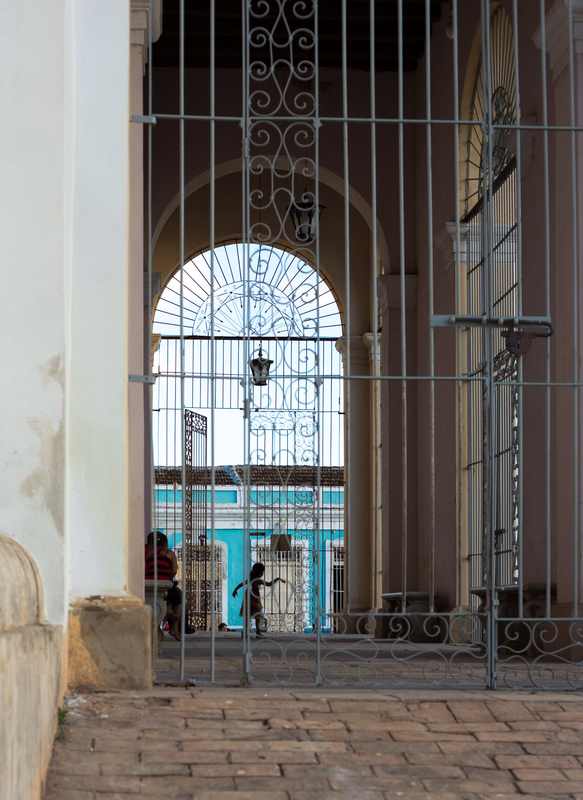 An architectural historian’s experience of visiting Trinidad. 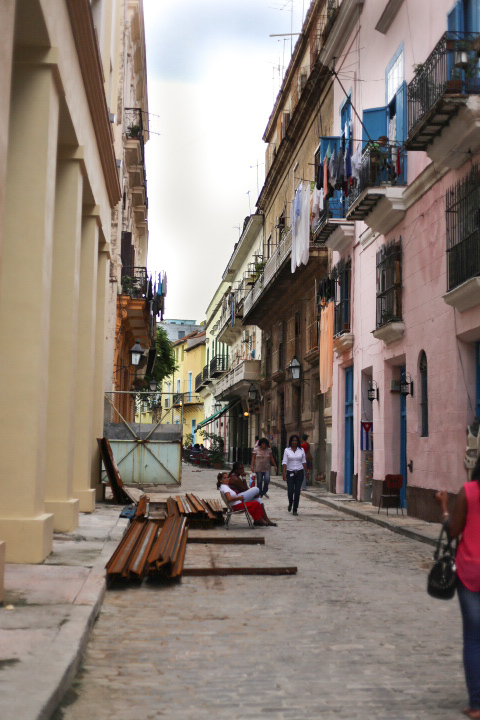 I wandered the streets seeing how life is lived today and imagining what it might have been like 200 years ago. 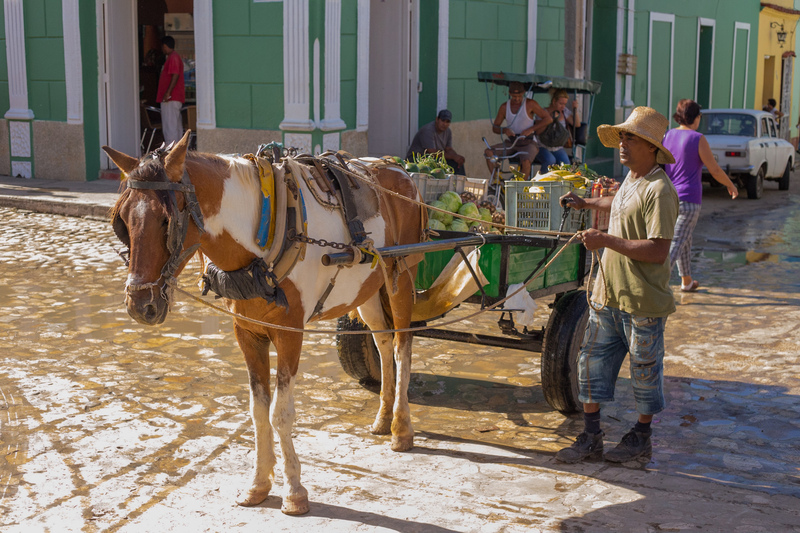 It is hard to imagine such times, where now the main industry is tourism, most locals are employed in the servicing of the tourist industry or making and selling trinkets on the streets to the passing crowds. It is a vibrant town, colourful and busy with musicians playing everywhere, in restaurants and cafes as well as on the street. 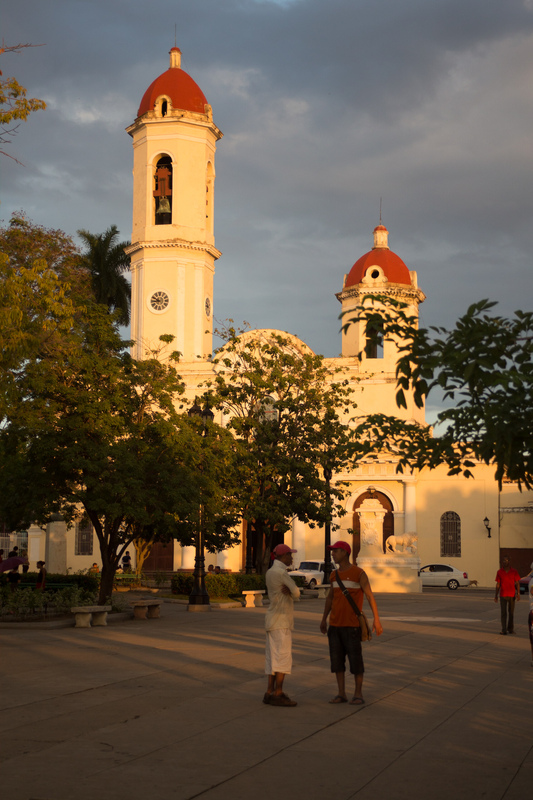 Salsa is danced every night on the steps of the church, life is lived on the street where people congregate to watch passers-by and to catch the breeze. 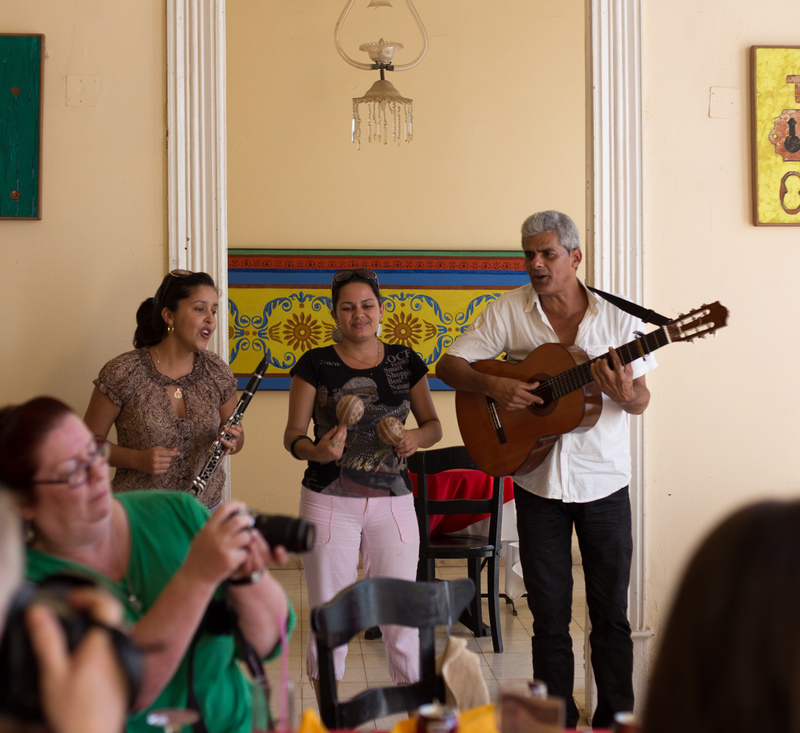 The band Grupo Ensueño in a restaurant playing for us whilst we ate delicious pizza. 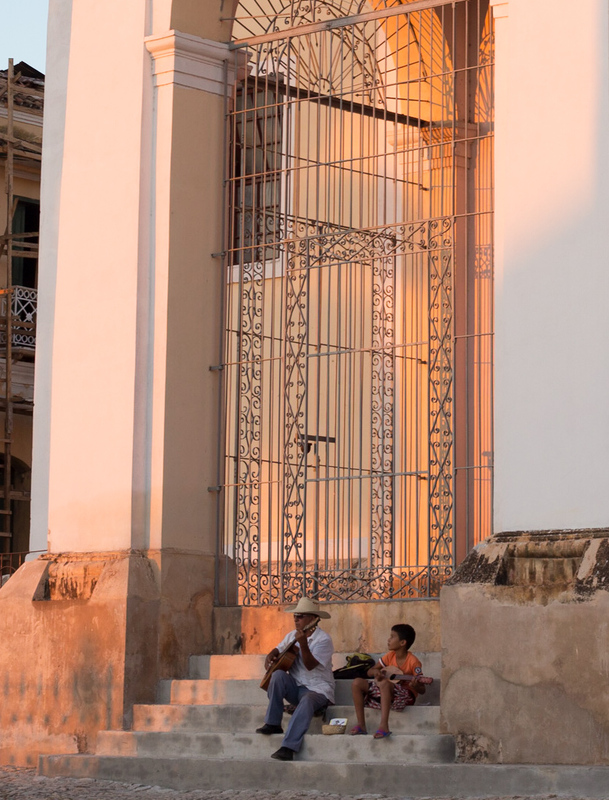 A man teaches his son to play guitar on the steps of the church just before sunset. He sits outside watching, she stays inside and pops out to check on him every now and then. He sits there only in the afternoons after the sun has moved around. 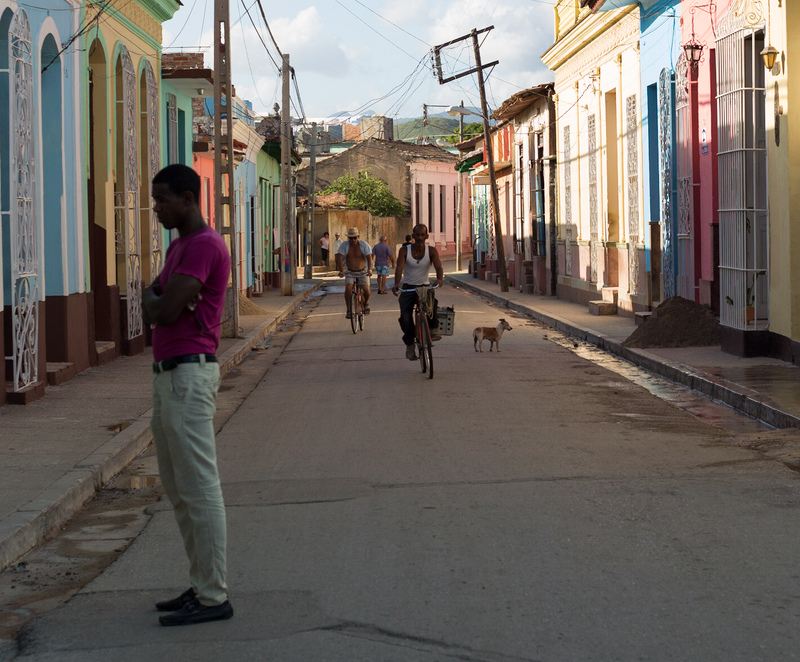 A typically colourful street scene in Trinidad, most houses are painted in bright colours, it looks vibrant and bold not at all cute. 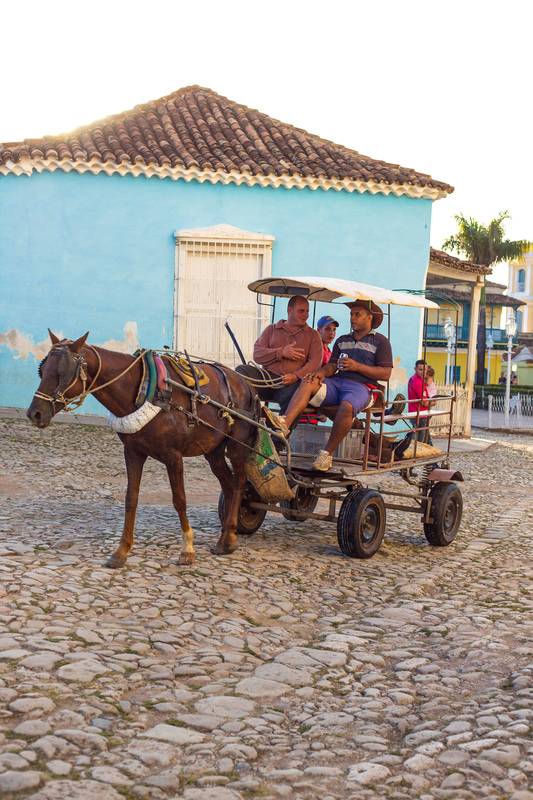 Horse-drawn carts are a common sight, hooves clanking on the cobbles and with a cloth canopy to provide a patch of shade. 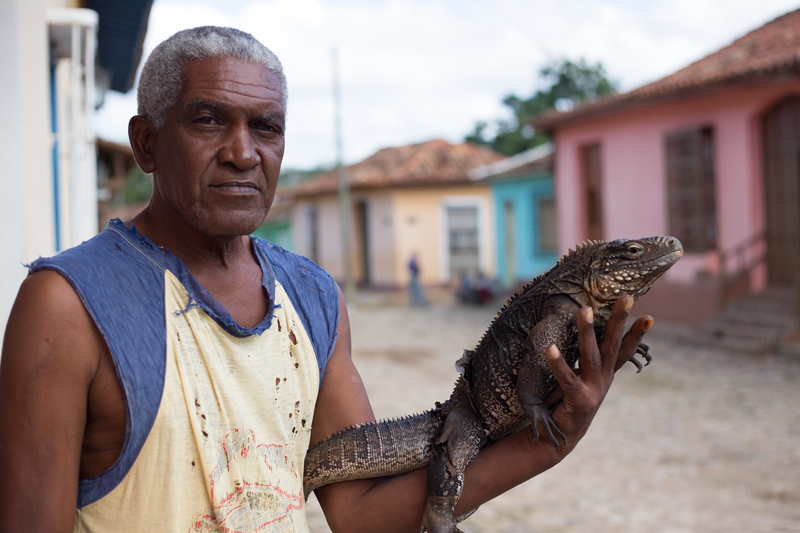 Wandering the streets I came upon this iguana sitting on the edge of the road, I was cajoled into taking its portrait along with its owner. I was stupidly nervous of the creature, it’s skin looked unpleasantly both papery and greasy. 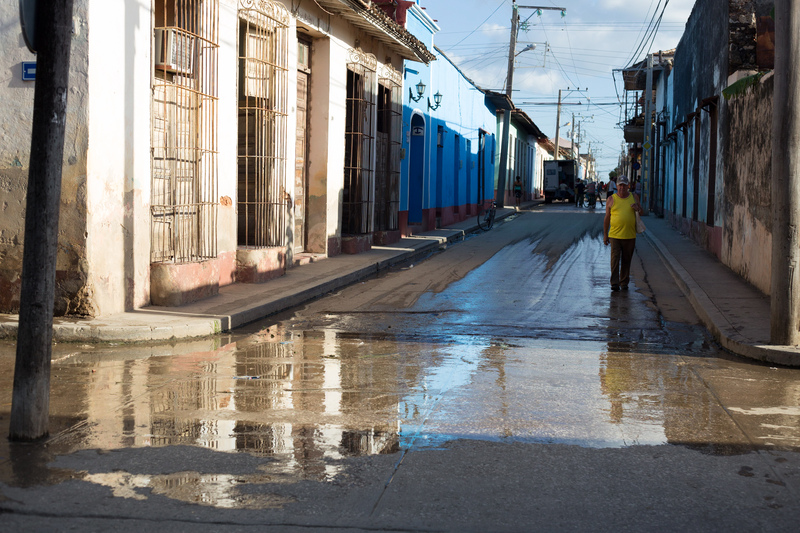 The shady side of the street painted blue by the flowing water. 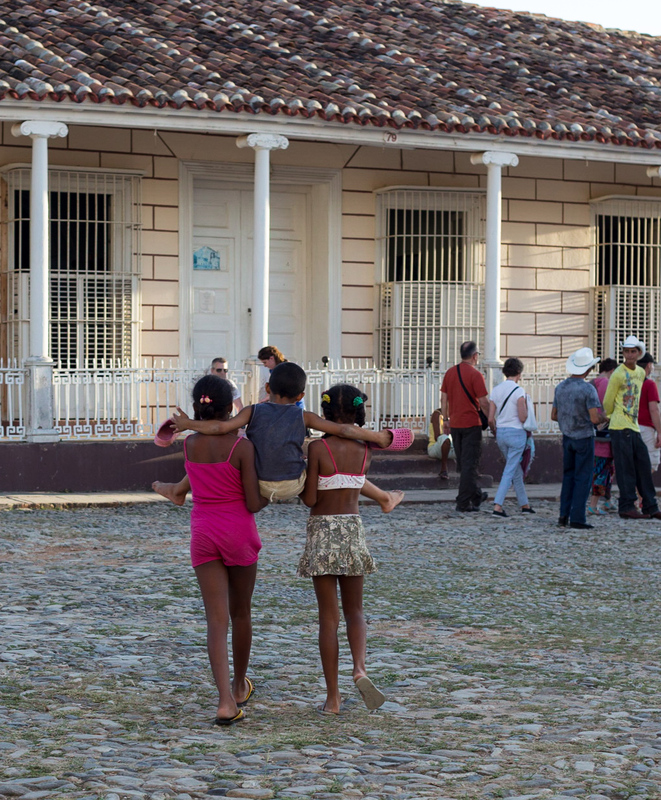 Children play everywhere in the streets, happy and safe, motorised traffic is banned from the centre of the old town so the streets become a playground. 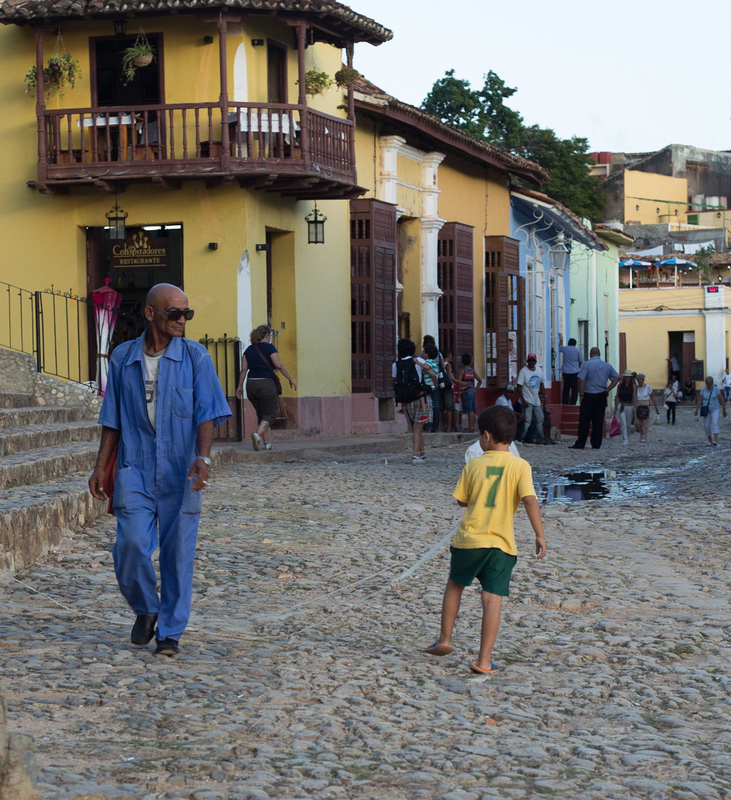 This little boy and his friend were trying to fly a kite between the steps outside the church and the large cobbled square. I watched them, full of energy as only small boys can be, running up and down the steps trying to get the makeshift kite to fly, never disheartened by their lack of success. Several passers-by walked straight into the thin pale kite-strings, not seeing them in the bright sunlight and got tangled up. 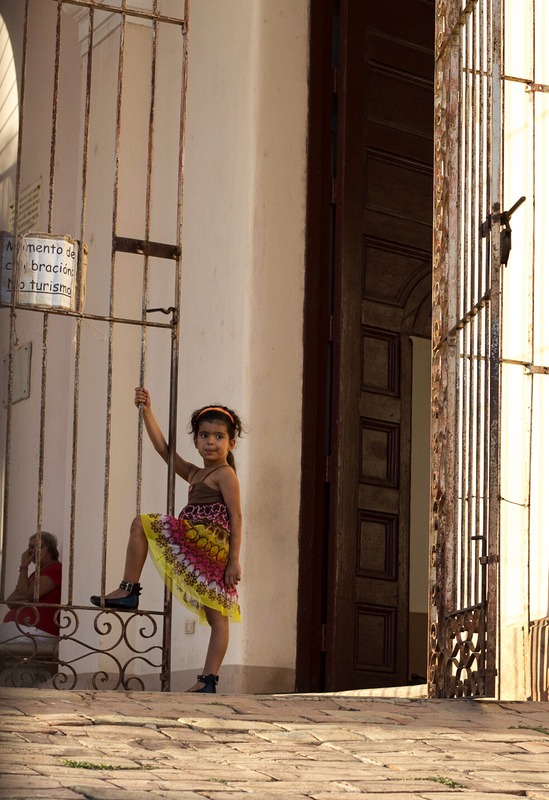 The little dancer, oblivious to any audience, twirled and posed in a world of her own. 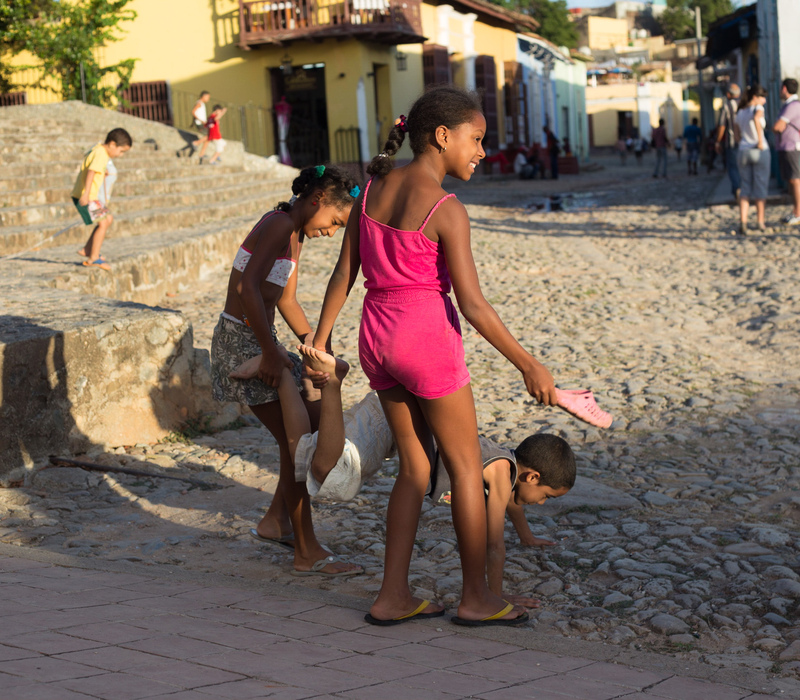 The two girls are forcing the younger boy to play wheel-barrow, the cobbles must have been painful under his hands. Later they switched to carry him between them, each holding a leg, the poor boy nearly doing the splits. 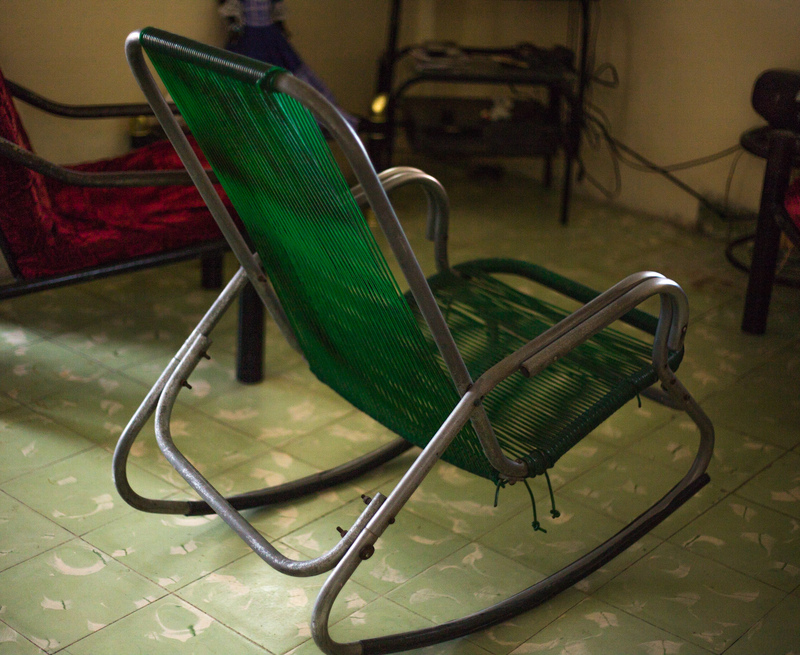 I stayed in a Casa Particular “Casa Carlos Sotolongo” on Plaza Major – the Cuban version of a bed and breakfast house. 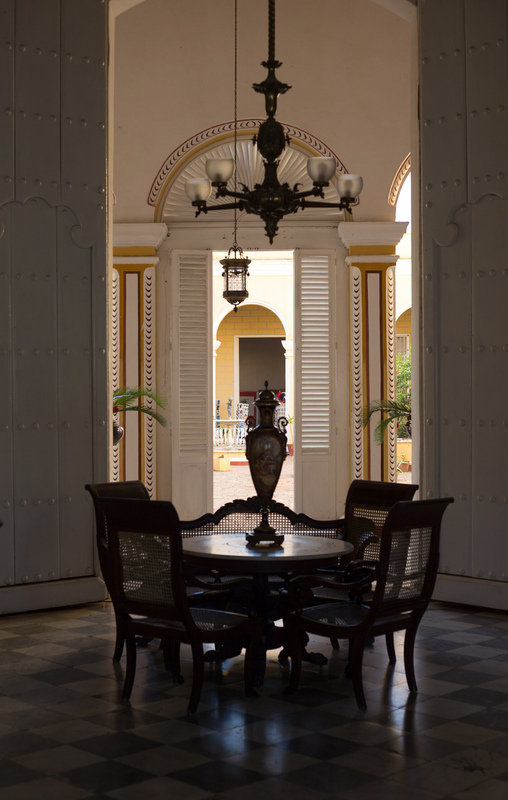 In Trinidad, these are often grand houses full of antique furniture, china and glassware imported by the Spanish plantation owners in the 19th Century. 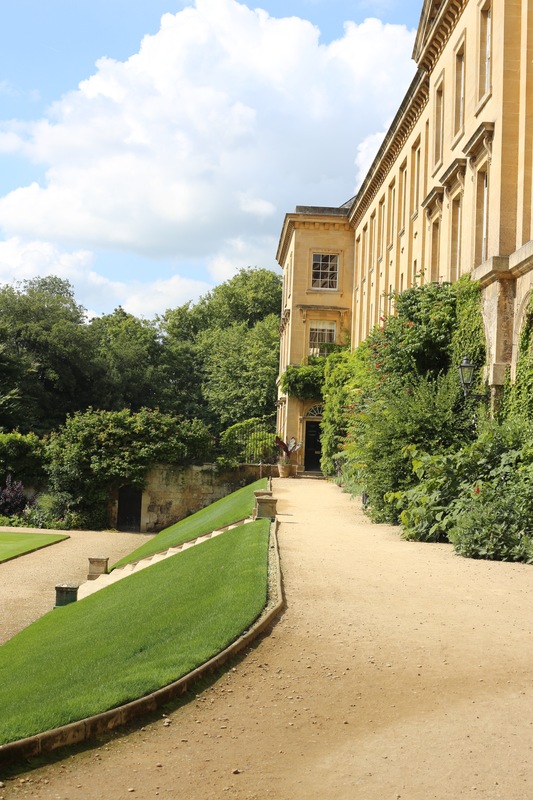 They usually only have one or two bedrooms for hire and modern bathrooms have been added.The hosts are very happy to cook for their guests, breakfast is included but they can provide lunch and dinner as well. A room in the historical museum set up as it would have been in times gone by, the Casa Particular I stayed in was similar though less grand. Lunch at Maria’s Casa, barbecued pork steaks with an array of side dishes, including pounded plantain, the slices are flattened with a mallet and then fried. We also had yucca – a little like steamed potato but with much more flavour – with fresh home-made pork scratchings – delicious. We had dinner there one night too which was a banquet with lobster, beef in a rich sauce, white fish fried lightly in butter and so many side dishes we thought we would burst. Then the compulsory ice-cream and cigars for those who partake. 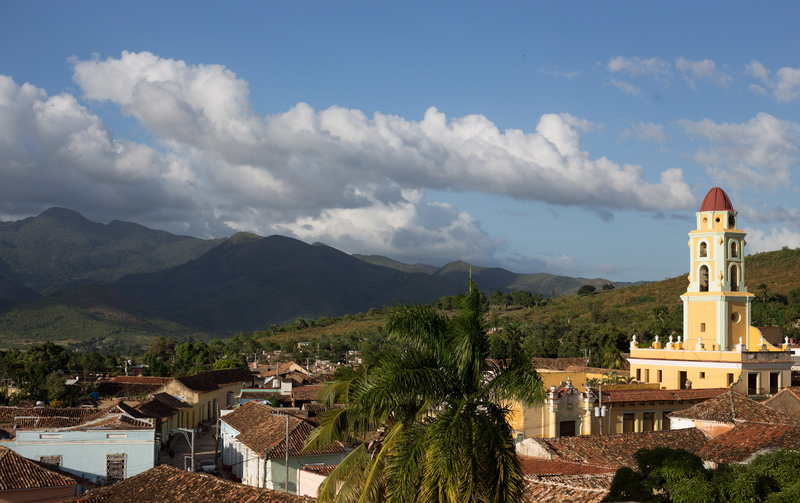 Hostal Maria and Enddy, 407 Calle José Martí, Trinidad, Sancti Spiritus, Cuba. 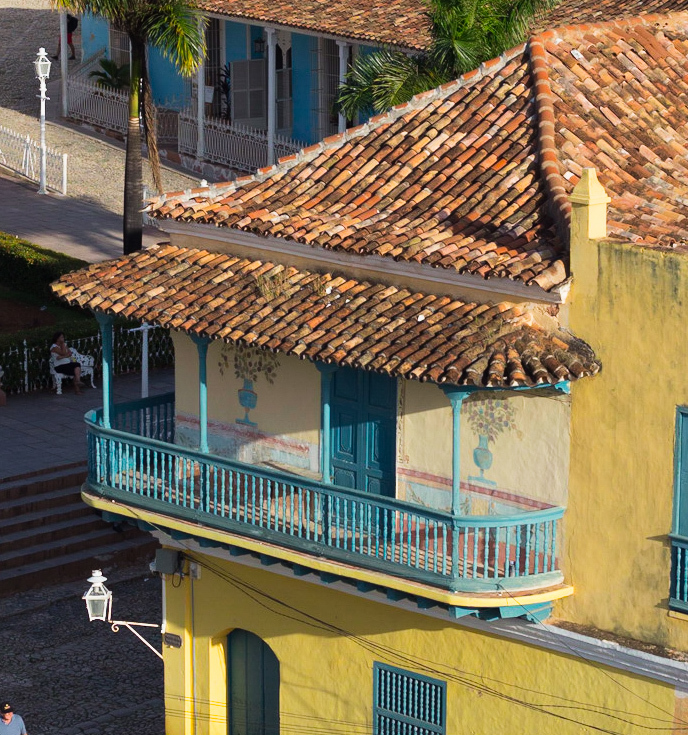 From the Historical Museum tower you can look out over the town, the streets curving round the hill, towards the Valle de los Ingenios, the valley of the sugar plantations. Plaza Mayor from the tower. 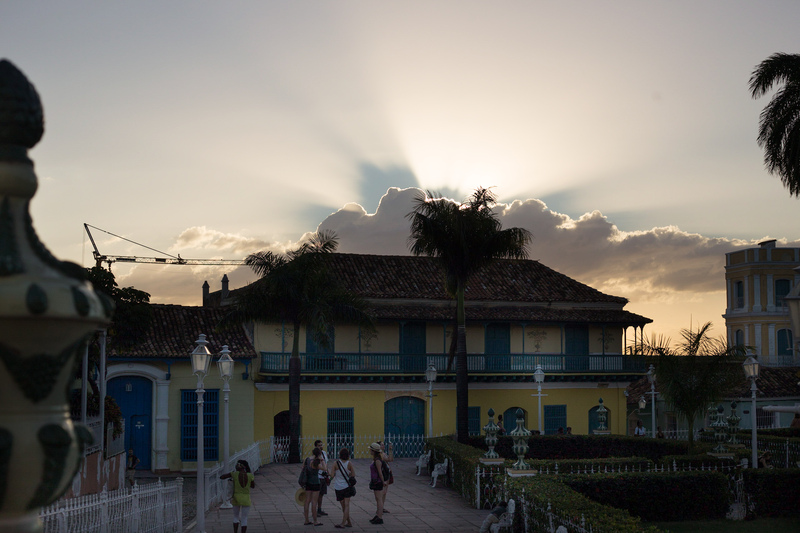 A grand house on the corner of Plaza Major, two stories and with a balcony and intact original painted floral ornament! 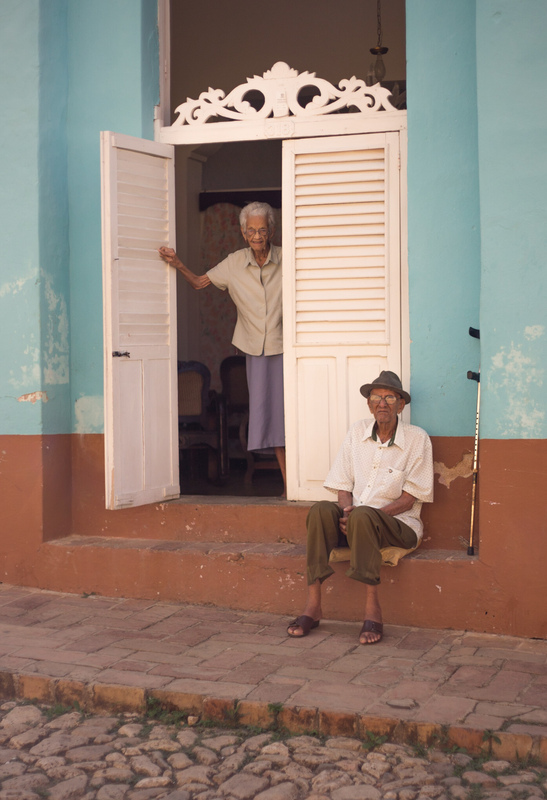 Most houses in Trinidad are single storey, the grander houses are two storeys and very occasionally they have three. 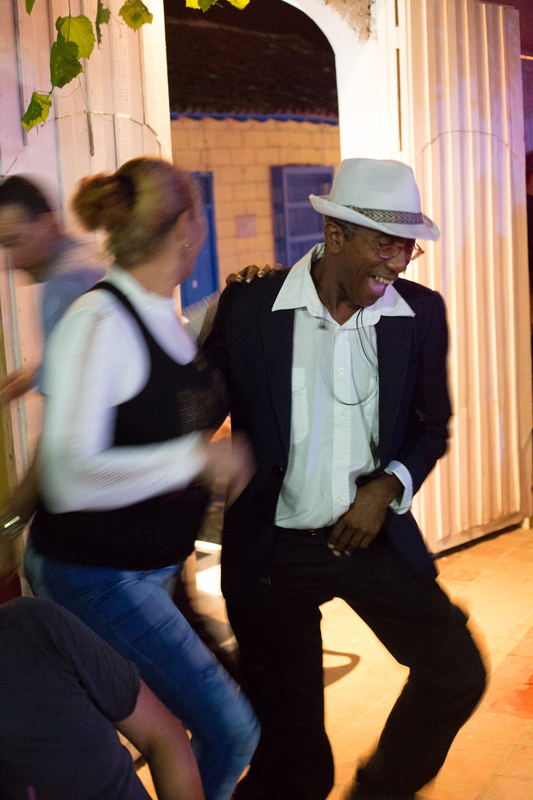 The best salsa dancer in the Palenque de Los Congos Reales, always laughing. 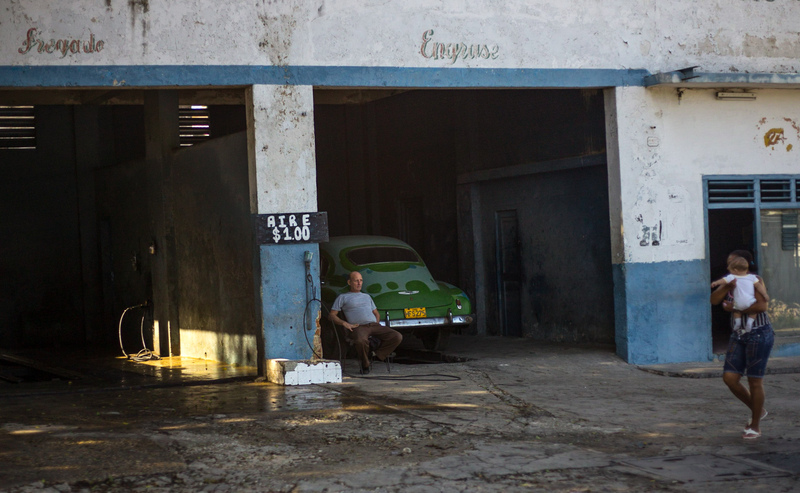 On the road into Trinidad a car wash guy takes a rest in in the shade after washing down a precious vintage car . 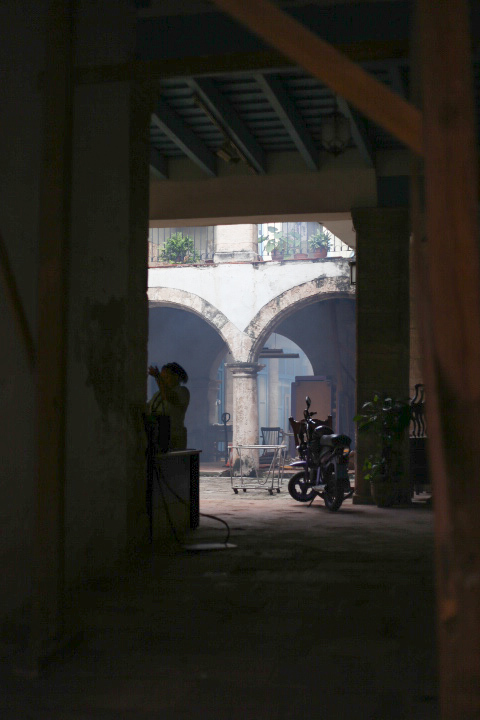 In Sancti Spiritus I saw this old man in his rocking chair keeping cool in the deep shade of the typical Spanish Colonial arcade, I’m not sure what his job was, a door-keeper perhaps. 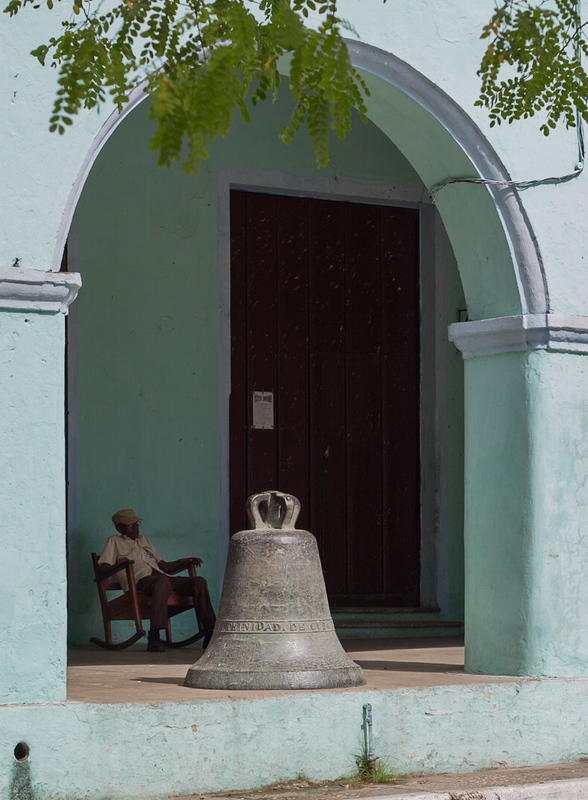 He sits behind an old bell cast with the words Trinidad de Cuba. The hat maker and the singer from the band in the pizza restaurant where I was sitting, watch as two policemen examine a man’s papers, whilst a nurse walks past. Inevitably there is a Che Guevara T shirt in view too. 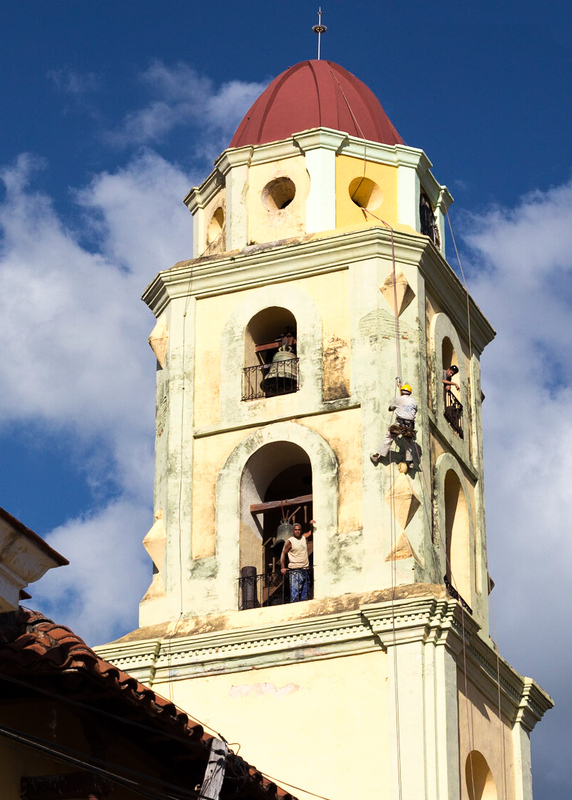 There are three men working on the restoration of the tower, all without scaffolding or even ropes. 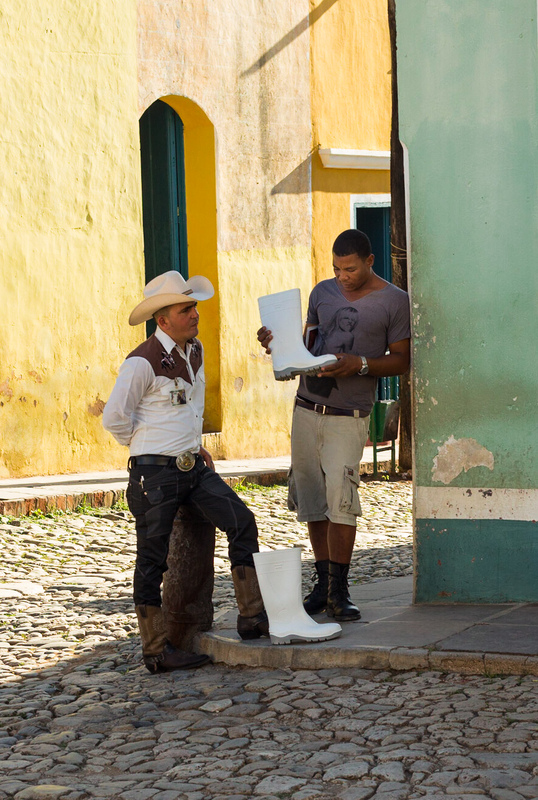 White Wellington boots seem to be the latest craze in Cuba, I saw at least three men wearing them or looking at some but I’ve never seen them in Europe. 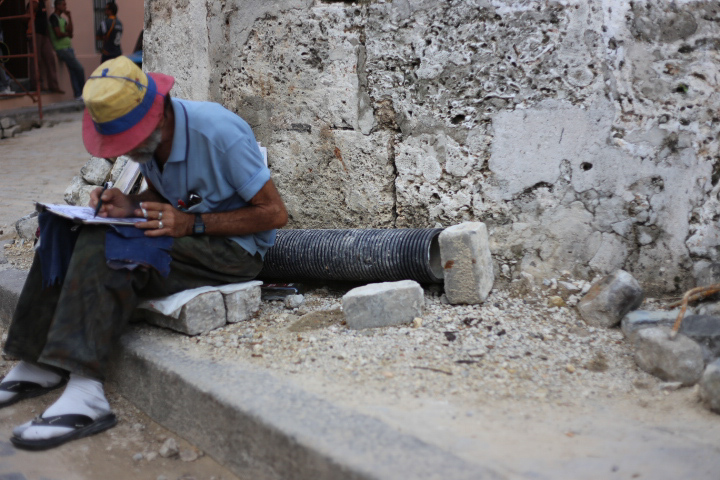 Cuba is full of colour, this painter tries to keep paint free by wrapping his head in a cloth whilst he rollers the bright blue paint. 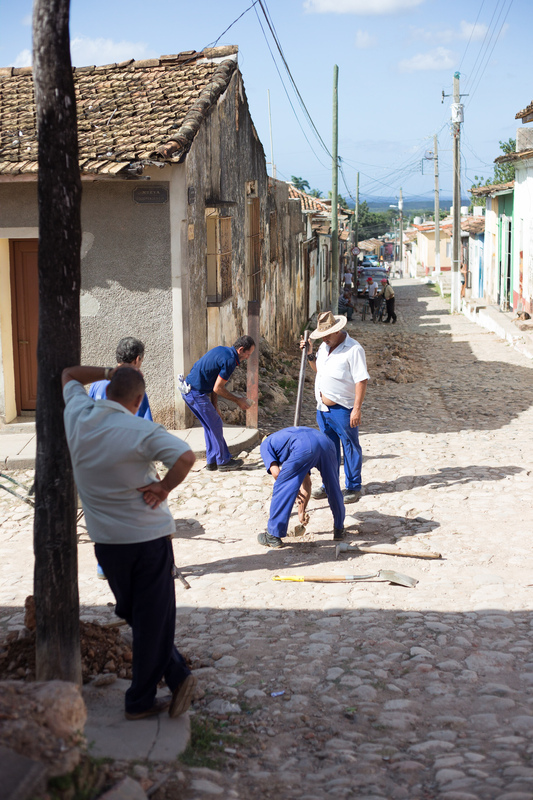 The old joke about how many people it takes to perform a task is true in Cuba too. How many men did it take to fill this hole, one to actually fill the hole, three to guard him or aide him as he does so and an obligatory passer-by to oversee the whole thing, oh and a photographer to record the occasion. 5 men, one woman. 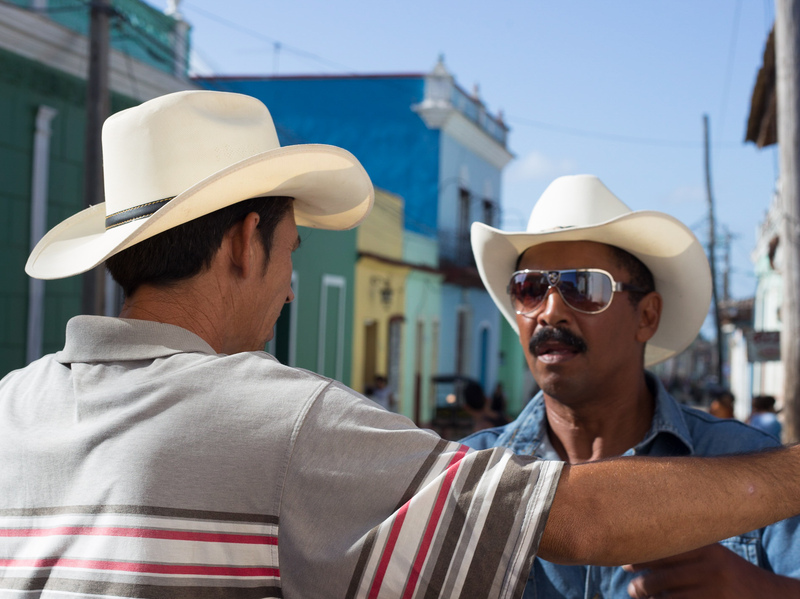 If only I spoke Spanish, these guys were arguing but who knows about what! 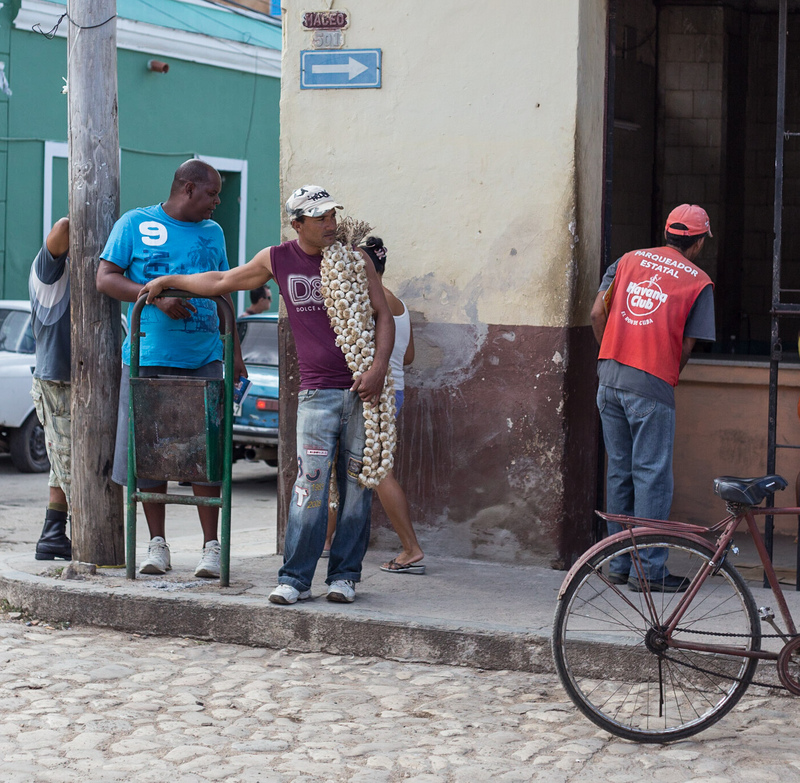 A young man stands on a corner wearing his long skeins of garlic like a shawl, he is waiting for his companion who has stopped to sell a string to a customer. A horse waits patiently in the shade for his owner to do some business. 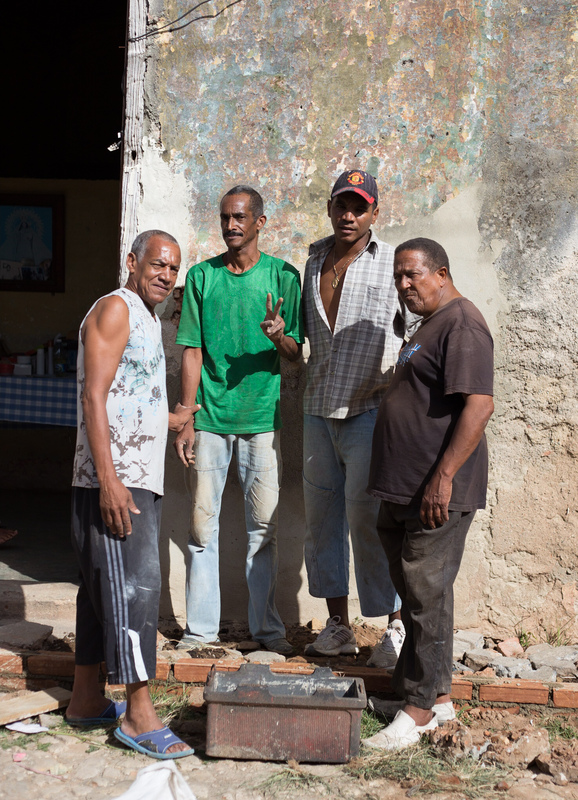 I met this crew of pavement workers and asked if I might take their photo, they were very pleased, happily posed for me and made the peace sign. This trader has come into town bringing his wares to sell to Trinidadians. Everything is freshly sourced from his and his neighbours plots. 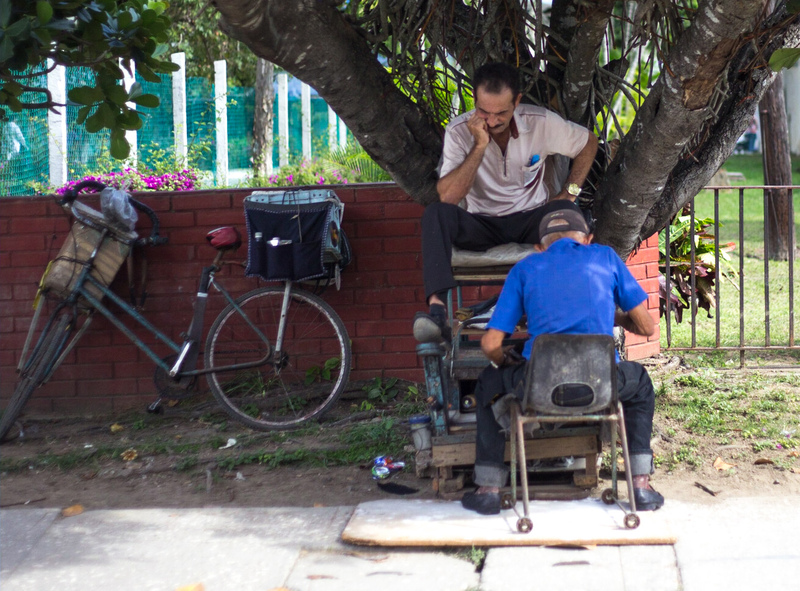 The shoe-shine man – a bicyclist stops by for a quick buff-up and a rest in the shade. 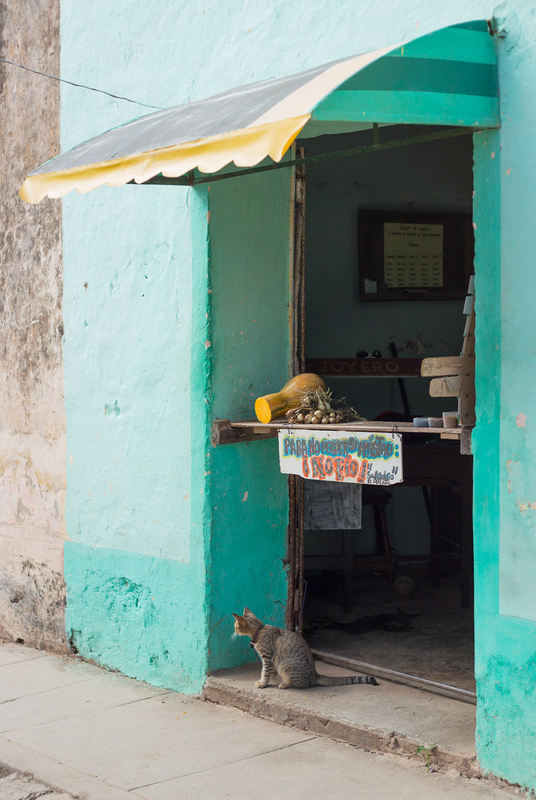 The cat watches out for any new customers at this little stall on a side street. On sale are just the few vegetables that the owner has grown in his yard. The sign reads “If you don’t pay now, we are no longer friends”. 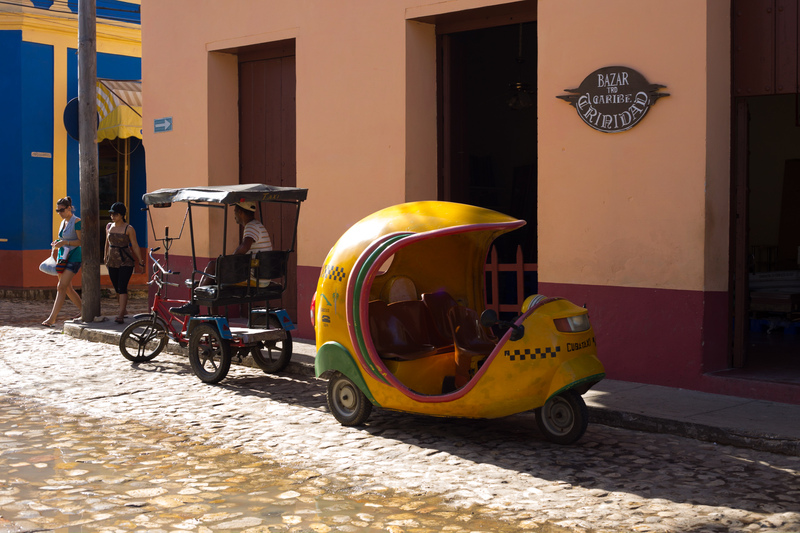 Tuk-Tuks and motorised CoCos are readily available for hire if you need to get somewhere quickly. 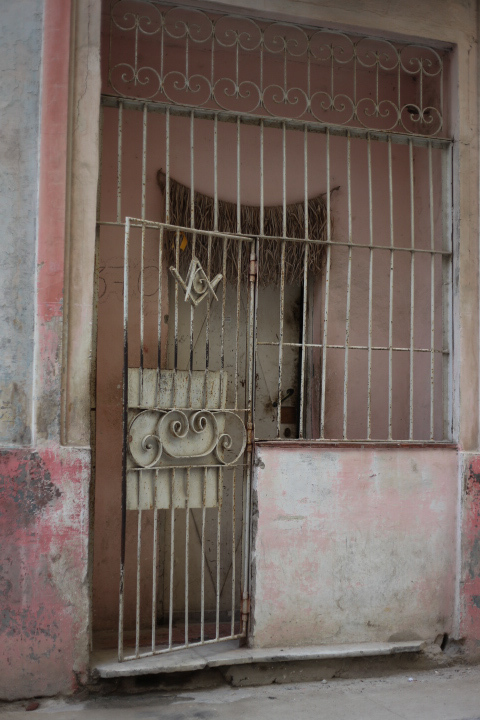 They are waiting on every corner and unlike cars and coaches, they can access all parts of the town. 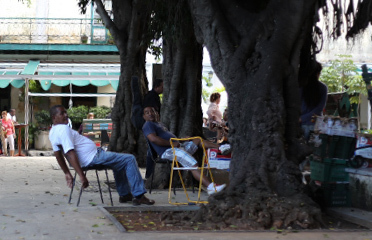 All around Cuba people sit outside their houses or businesses, taking advantage of any wafts of cool air. 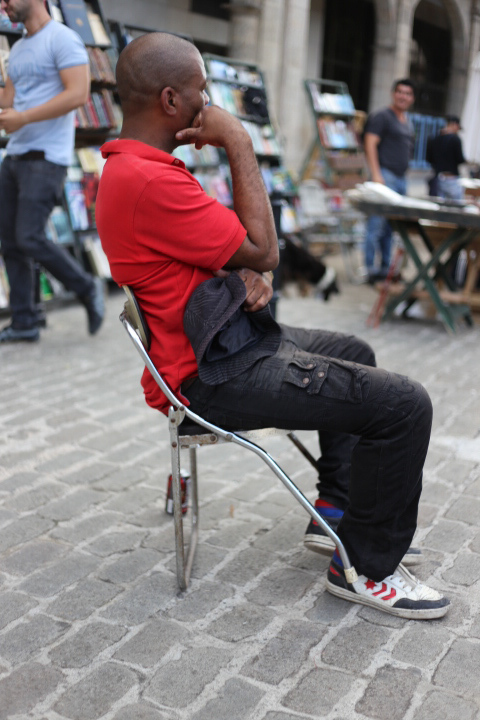 People sit on steps, boxes, curb-stones, wooden stools and if they’re lucky, a favourite chair. 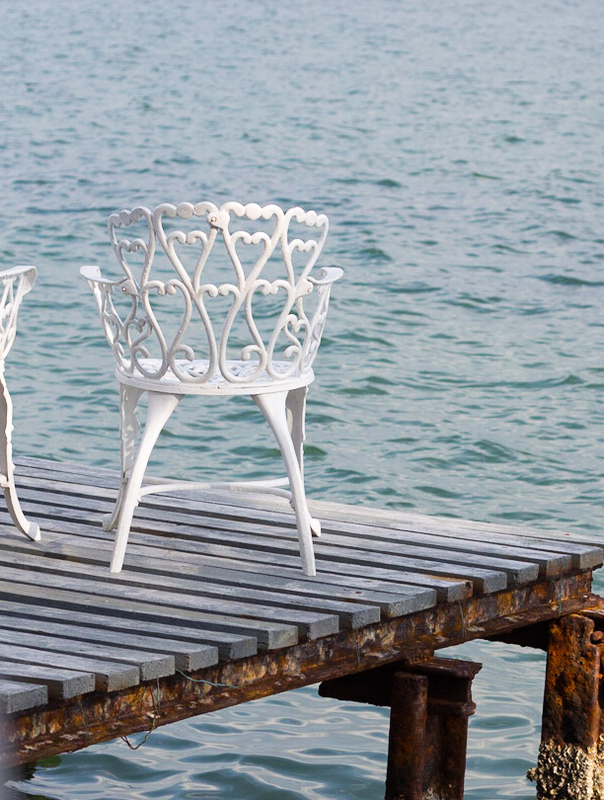 Often these chairs look like home-made affairs, ingeniously bent lengths of rebar or other steel rod, forming a basic structure sometimes adorned with flourishes. 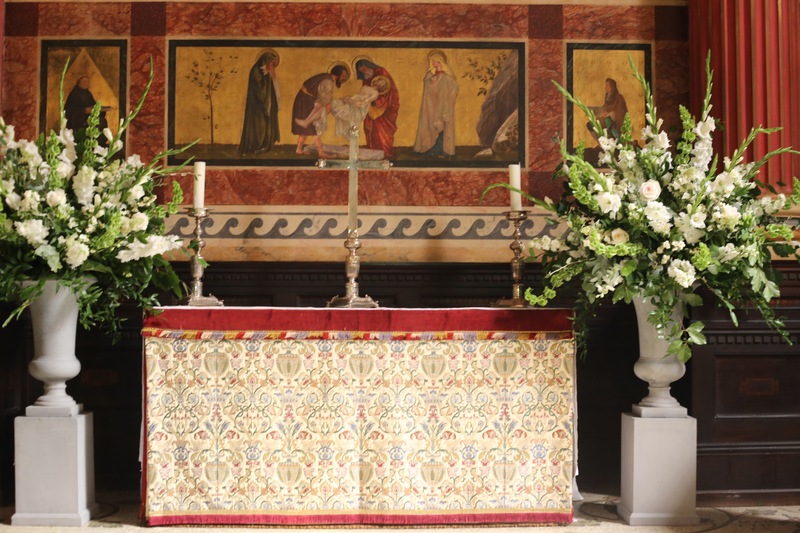 They are mostly very old, worn, re-painted and above all, well-used. 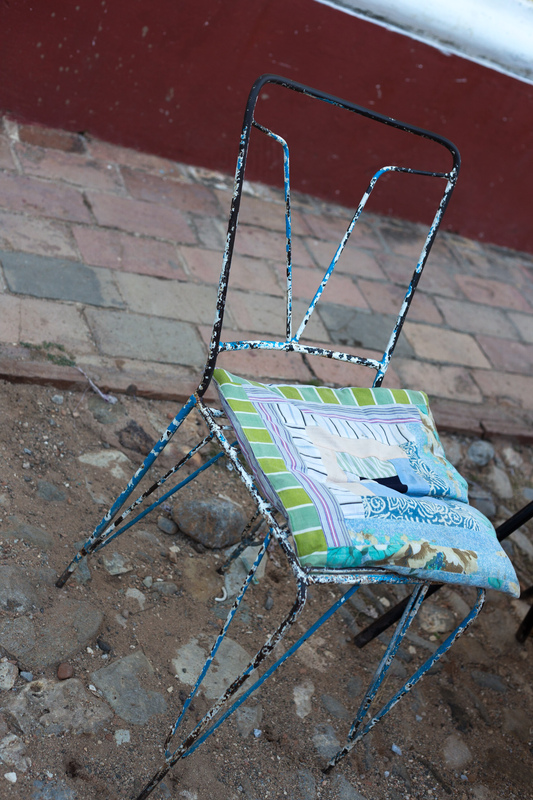 Havana – a new folding aluminium chair in the book market. 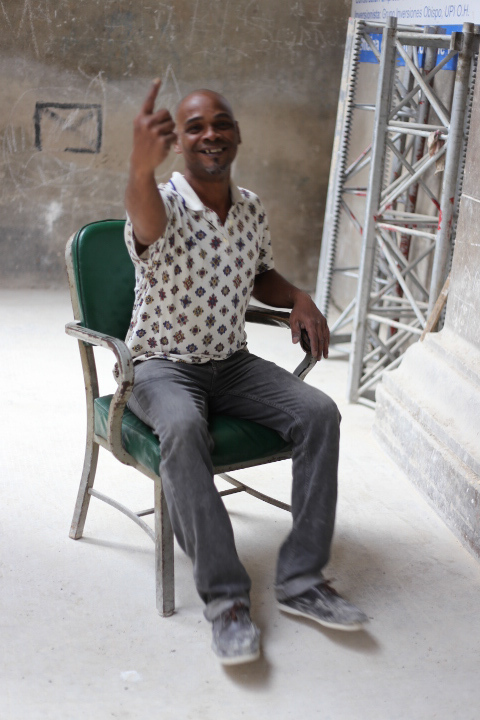 Havana – building site guard! 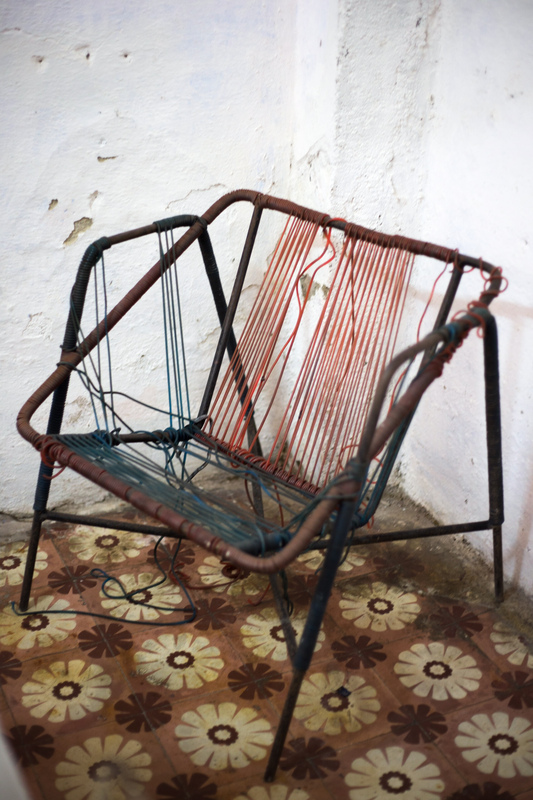 Havana – lovely example of a rebar chair with an extra flight of fancy by the maker. 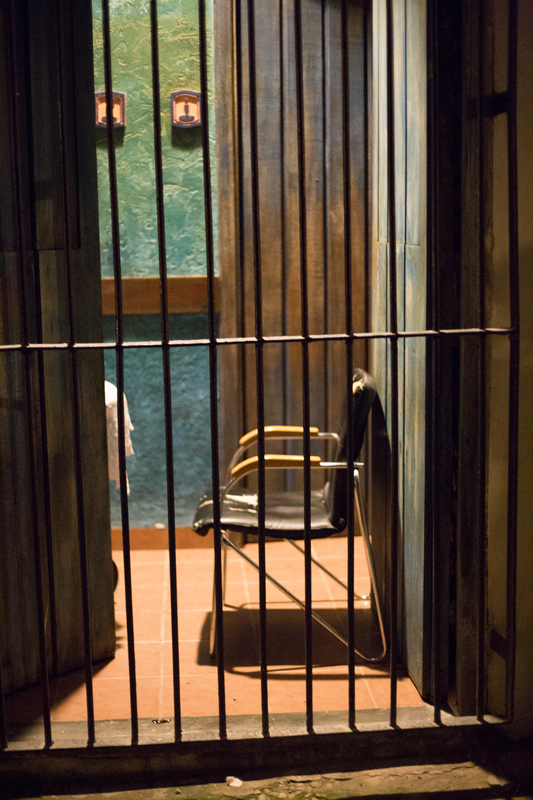 Havana – a 1960’s imported padded chair to sit on in your room behind the grille on a hot night watching the world go by. 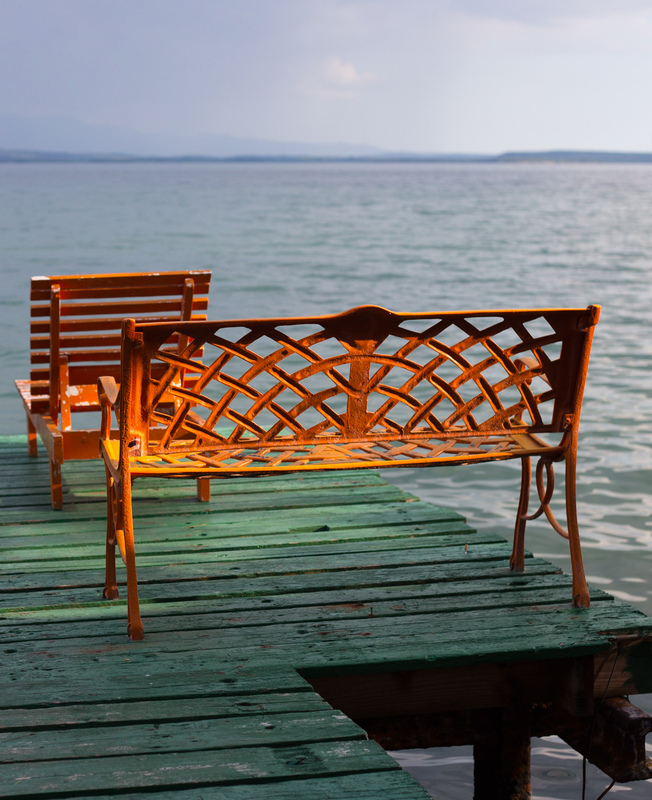 Cienfuegos – green decking – so paint your cast iron benches orange! 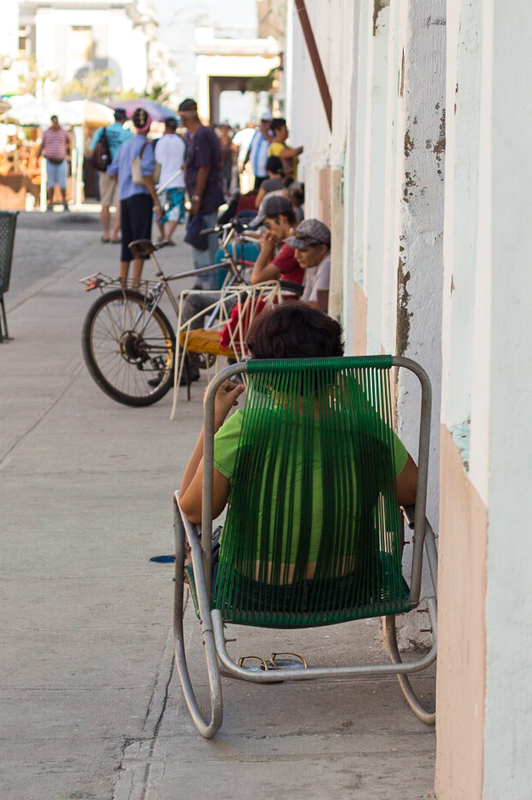 Cienfuegos – the basic aluminium tube chair have been strung with green plastic tubing, now over-stretched by so much use, today the occupant has chosen a green blouse to complement her chair. 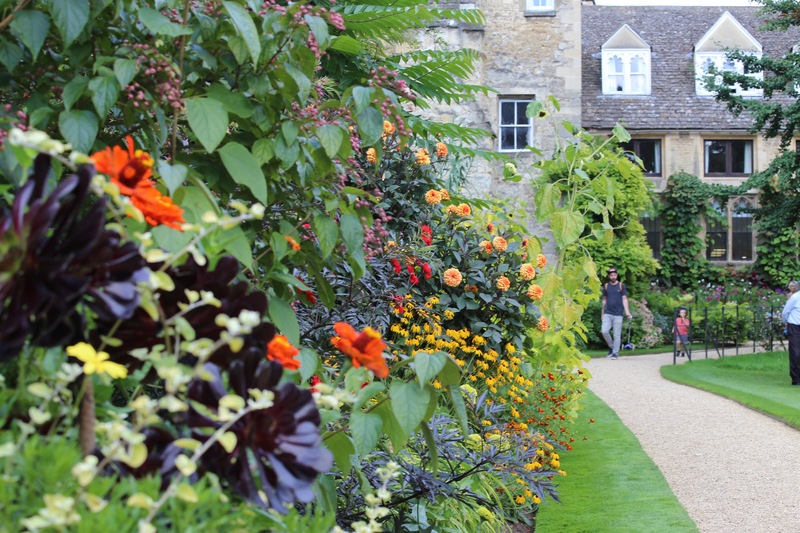 A glimpse of a shapely white chair just beyond with a good thick orange-coloured cushion. 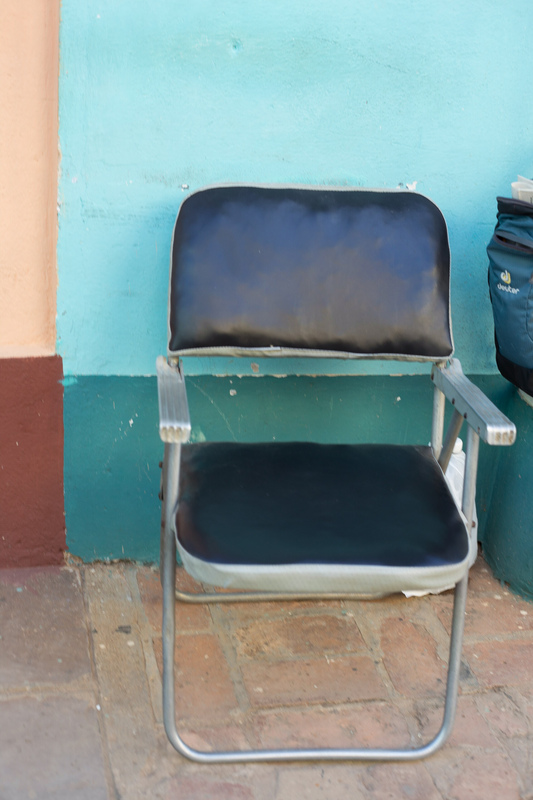 Trinidad – A scruffy old chair with many coats of paint and a new cushion, love the blue. 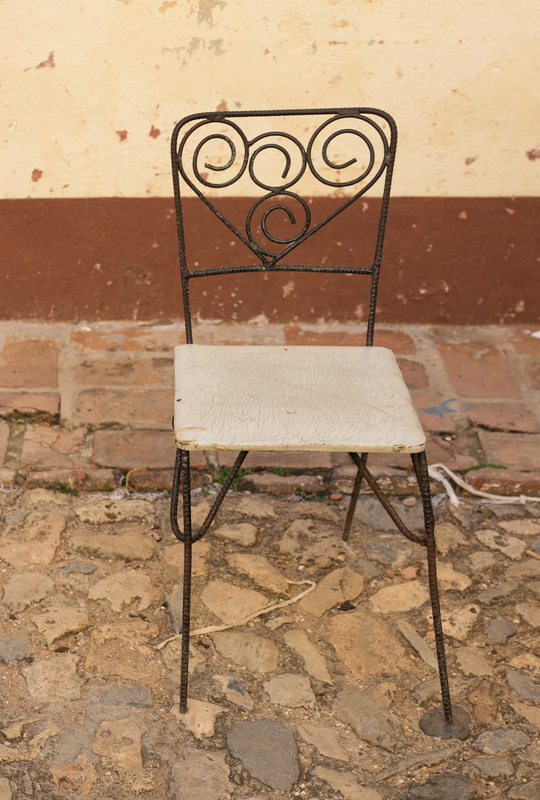 Trinidad – a comfortable padded, folding chair, with arms too! 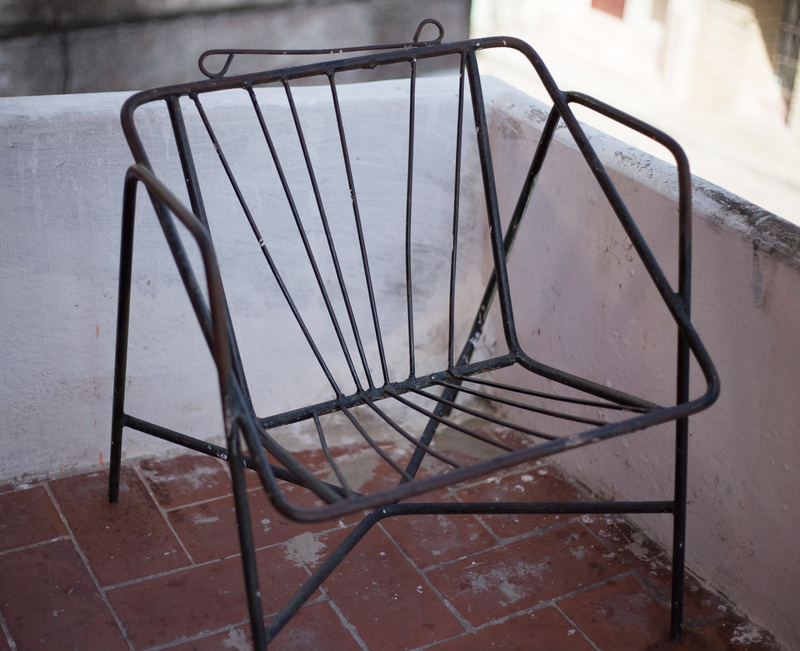 Sancti Spiritus – the only rocking chair I saw of this type, it is a fine example, strong and with good details, arms too. 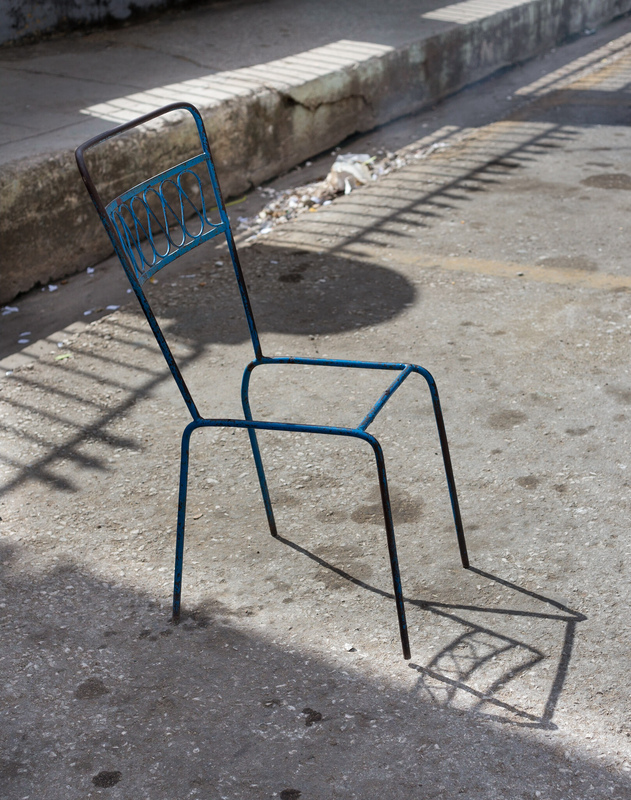 Santi Spiritus – a delightful chair making a good shadow tracing on the ground but no seat! 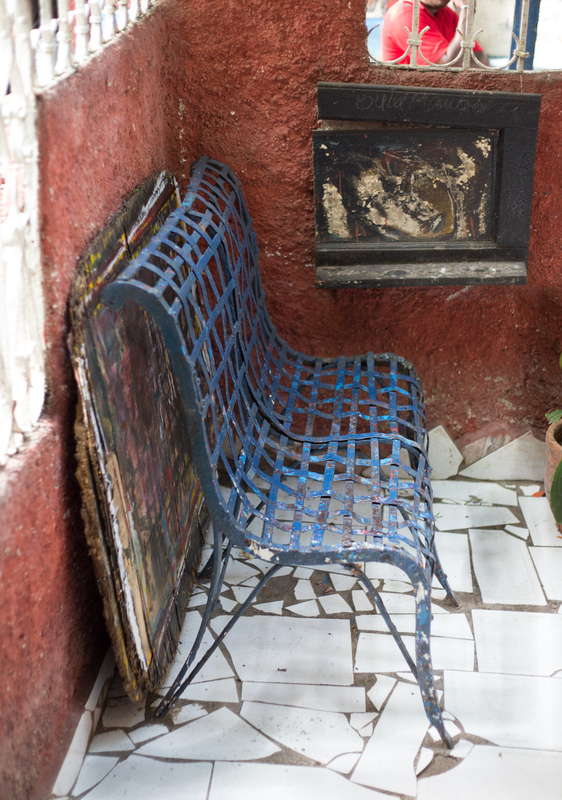 The owner of this chair, one of four, is standing just to the right, she invited us into her home to see her religious shrines but I loved the fabulously curvy chairs. 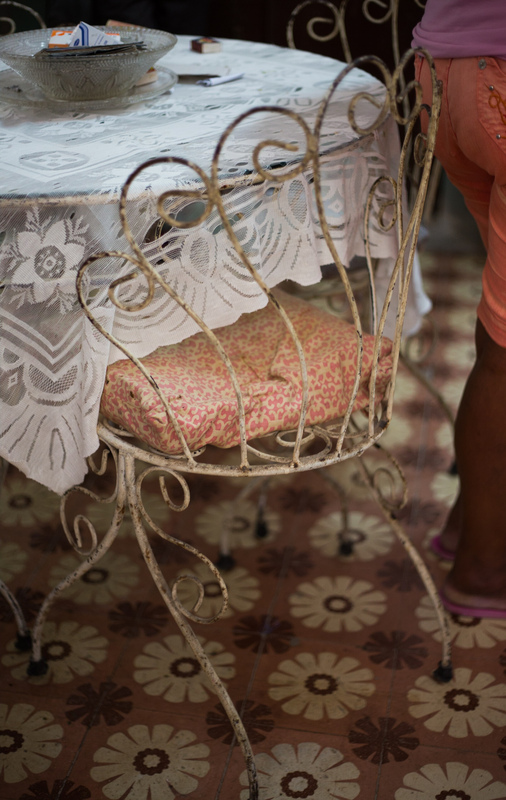 Havana – This broken chair is also in her kitchen right by the others, its an interesting design but the stringing is to loose now, I suspect it was her husband’s and he’s no longer there to sit in it. 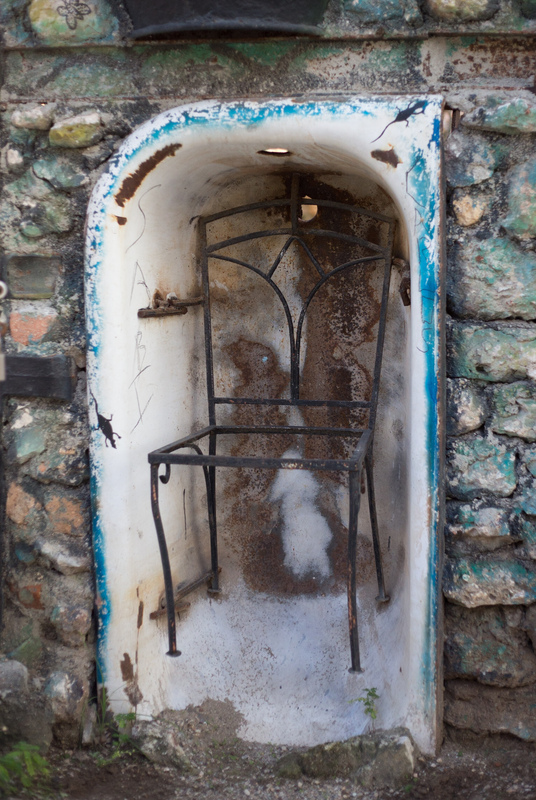 Havana – A very similar chair but with steel rods instead of plastic tubing, this one belongs to a Tarot card reader who invited us into her home,t has an interesting little flourish along the top. 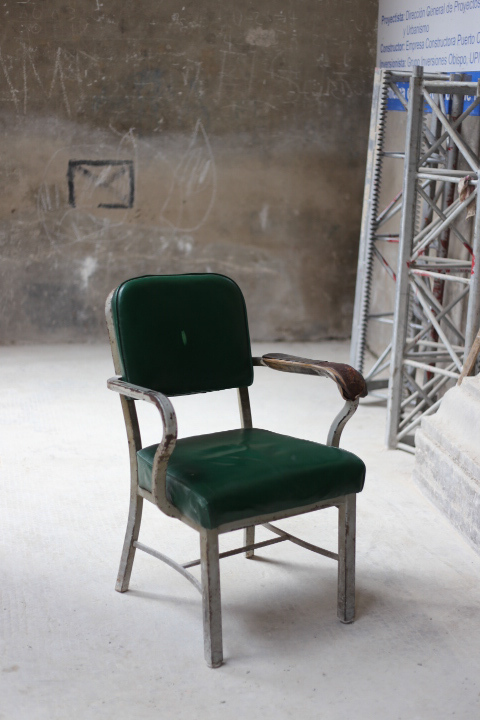 Havana – another chair belong to the tarot reader, this is a great rocker and the green tubing is a good contrast to the aluminium tube frame, bolted together. 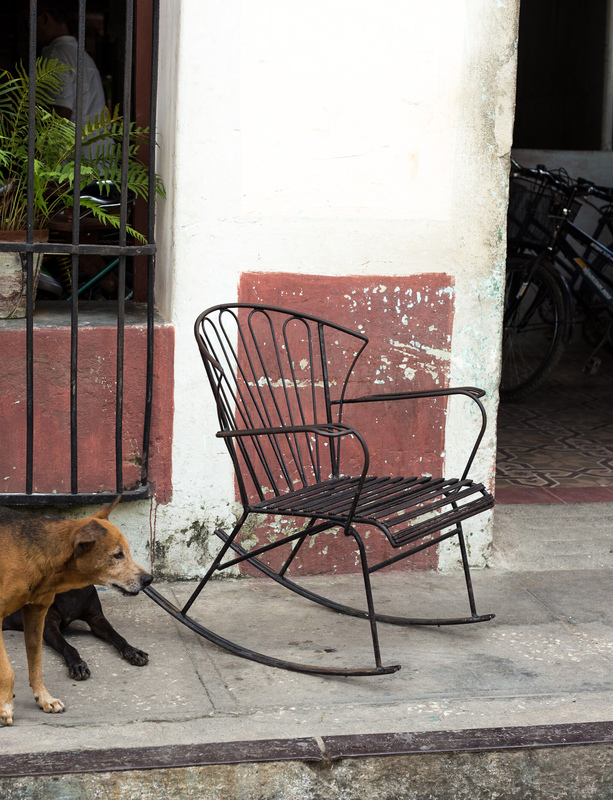 Havana – a bench made from iron strapping, – again the first i’d seen. It was in a zoned off district belong to a revolutionary group. 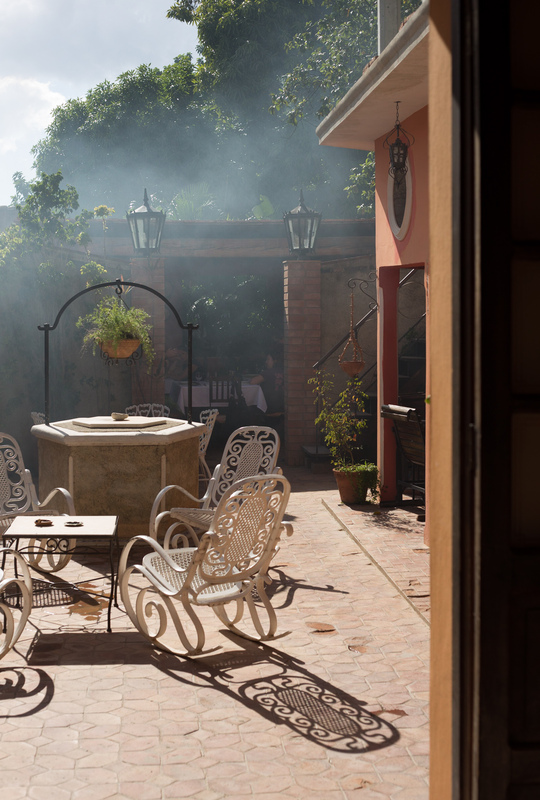 Vinales – a friend photographed this one for me as I didn’t make it to Vinales, it belonged to the tobacco grower whom they visited. 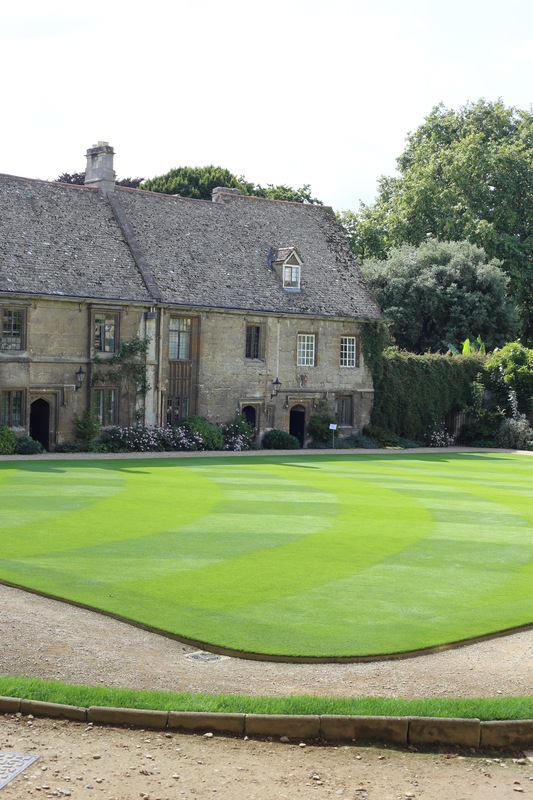 It reminds me of summer, tennis and lemonade! And there’s a face in the back, eyes high up and a long round-ended nose that seems o be upside down! The Cathedral and boys, all wearing red caps. 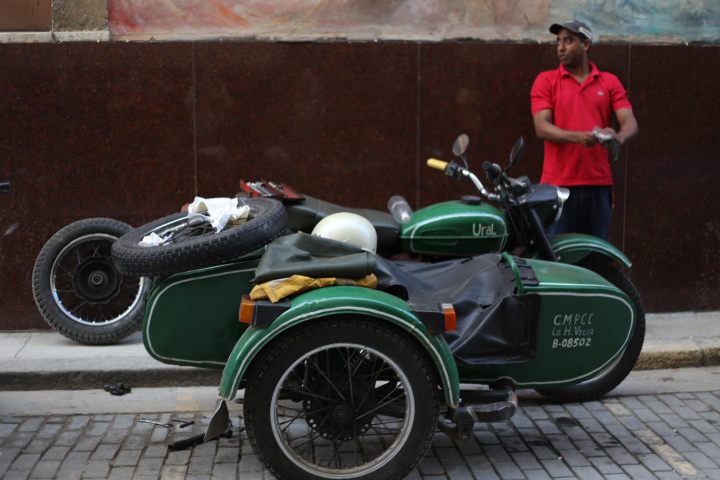 Of course there are cars and plenty of gorgeous vintage cars from 50’s and 60’s but the streets are filled with bicycles, horses and carts of all kinds as well as pedestrians. I thought I was taking a photo of a dark doorway but I lightened the image a little and discovered that I had caught a woman in the shadow who was obviously crying and upset. I hope I didn’t intrude. 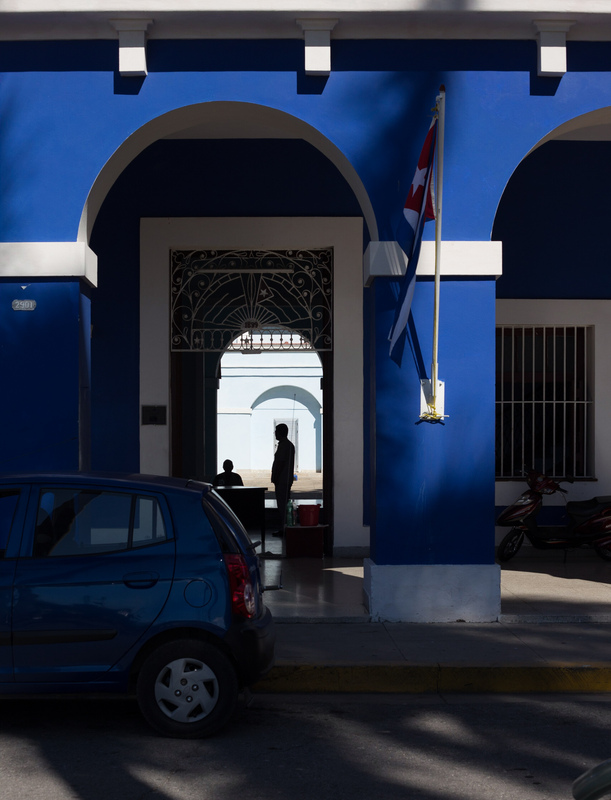 Cuba IS colour, a building painted blue as blue can be with a matching car parked outside, who could resist. 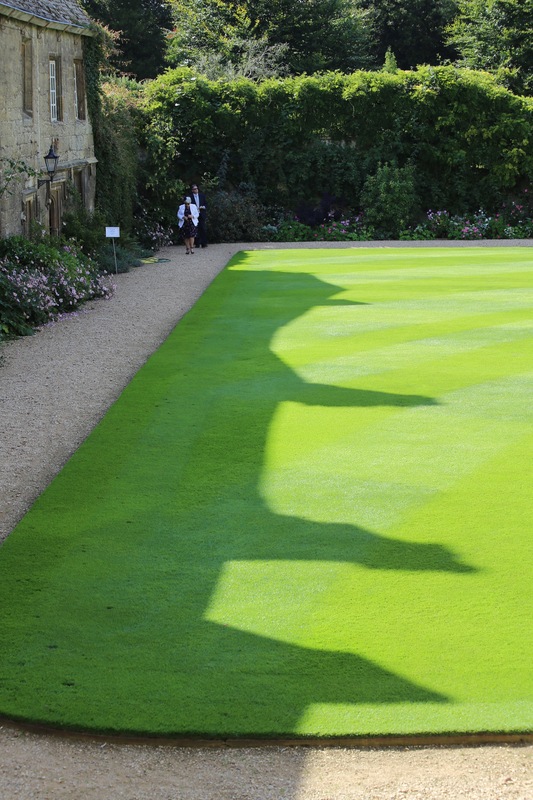 I waited for a figure to walk into the archway so that he would be silhouetted against the sunlit wall behind. 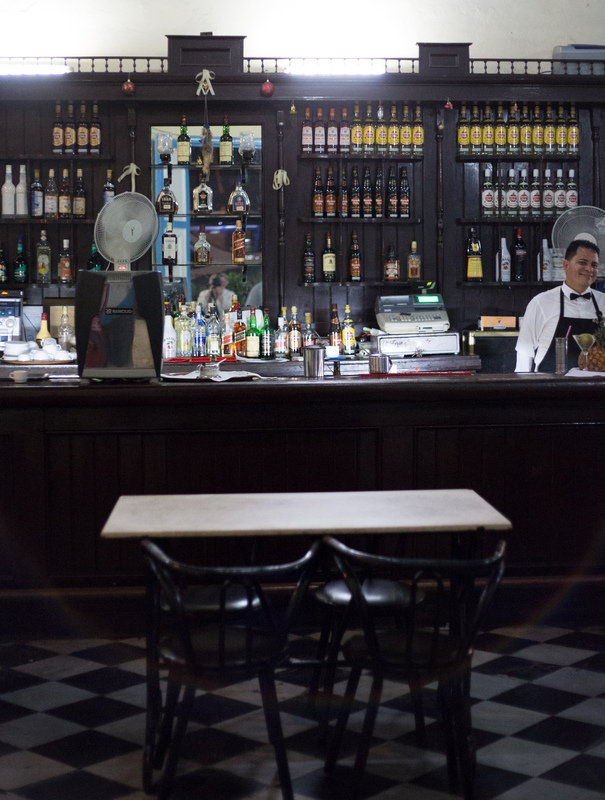 One of the many traditional bars we visited in Cuba, mojitos were the favorite drink, white rum, brown sugar, lots of fresh mint, ice and soda, refreshing and notso strong that you had to stop at one. Not sure of this exact location but an expansive view of a green valley and blue mountains, I followed the rule of including foreground interest, it seems to work well here. I believe the tree at the top is a Framboyan which produces large seed pods that can be used as a rattle when dried. 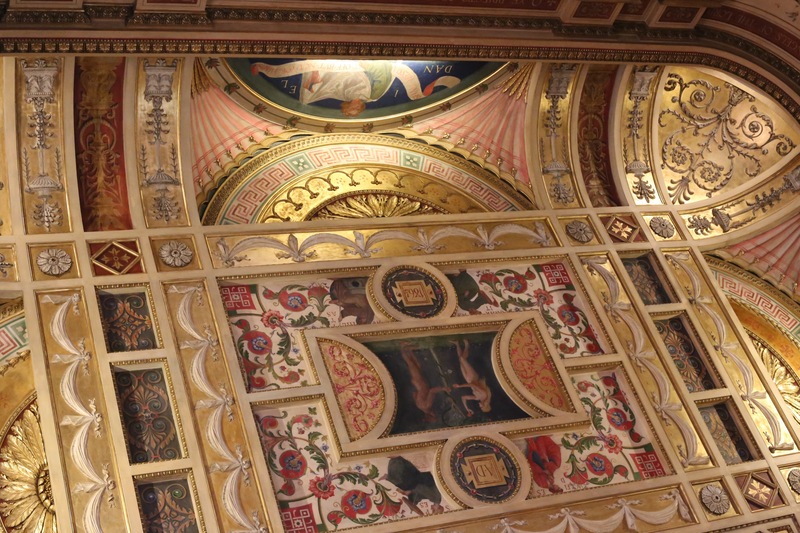 In the museum of Religion in Havana, we saw an example that had been painted with colourful geometric patterns. 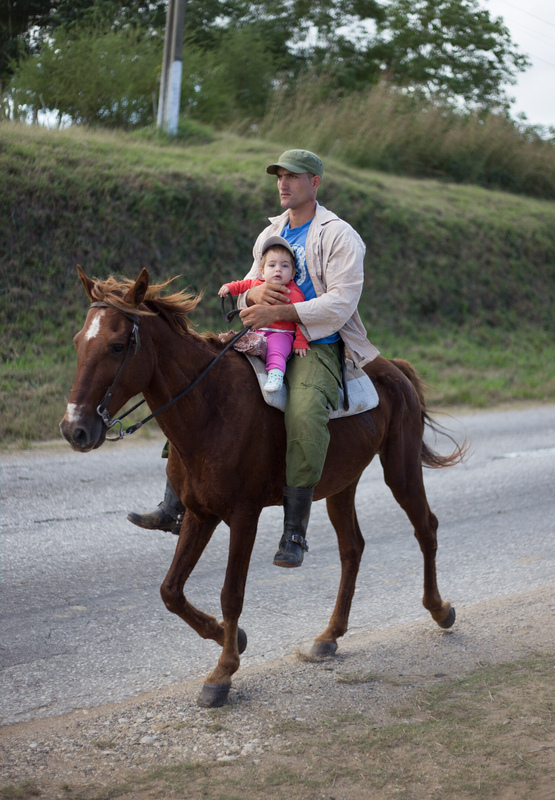 A dad bringing his daughter home on horseback, he is a farmer and kindly showed us around his small-holding. 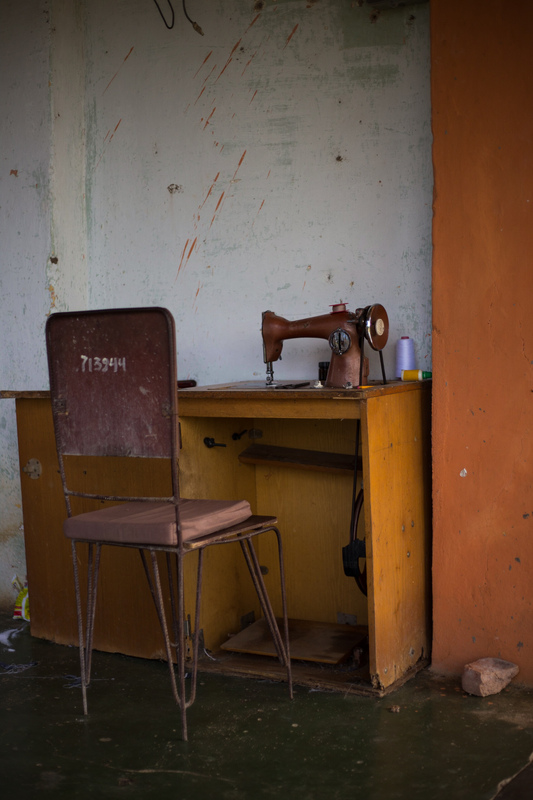 The farmer’s 1950’s treadle sewing machine, still in use and kept outside, but there’s no rust despite the humidity, plenty of oil is the secret. 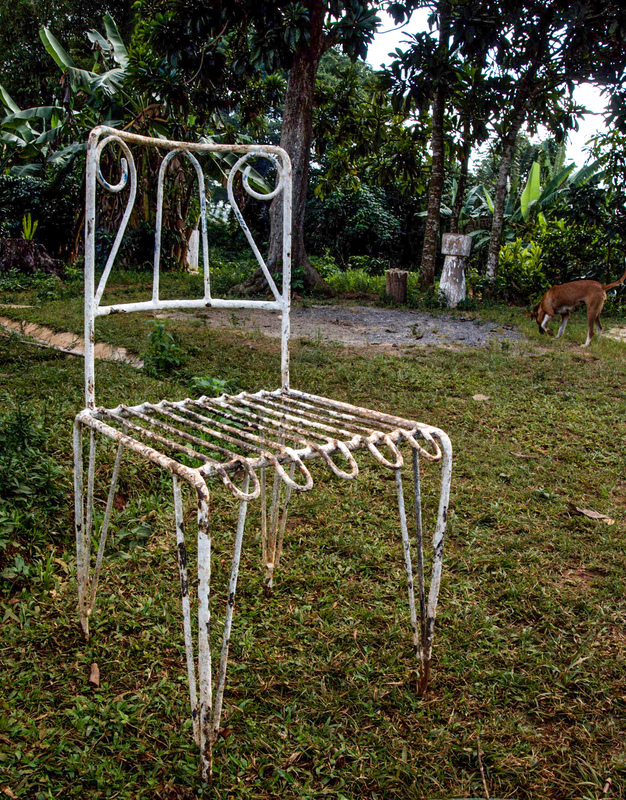 And the chair made from rebar like many others in Cuba. Craggy good looks and an amazing jawline, he could be the next big thing in men’s clothing modelling. 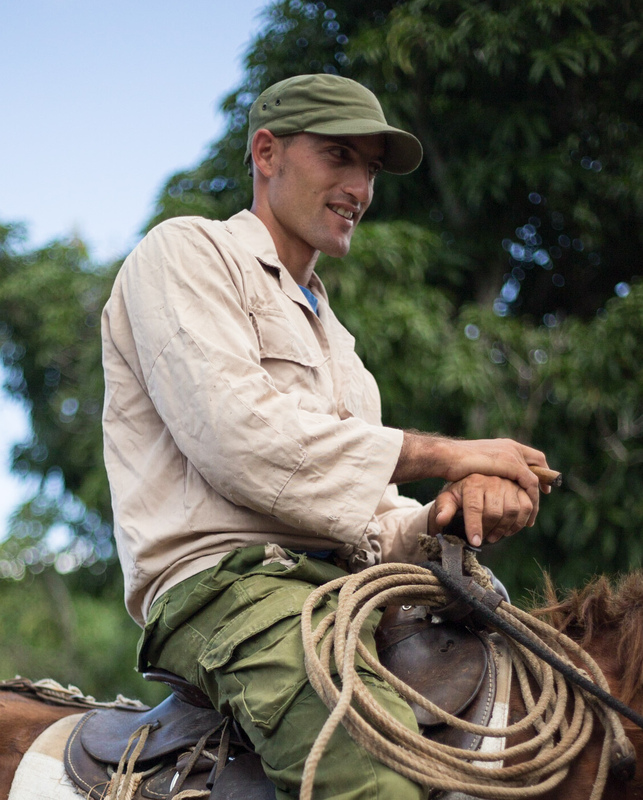 he seemed unfazed by being asked to pose on his horse for us. 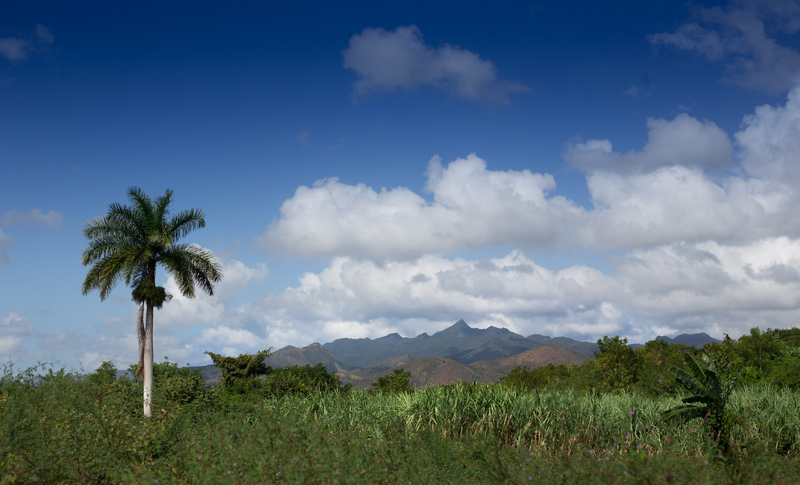 Sugar cane crops seen against the distant mountains, he also kept livestock, rare breed pigs, chickens and sheep. 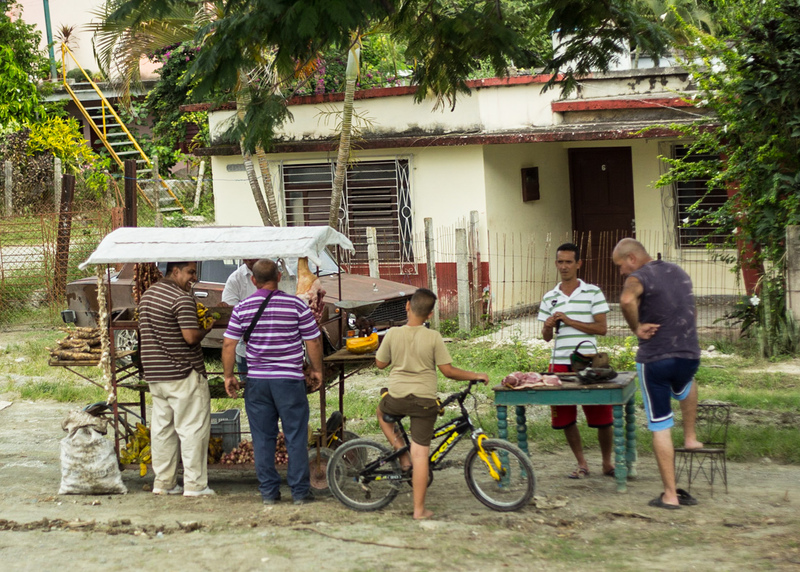 Out on the road again, a common sight are stalls and carts selling local produce, freshly picked vegetable of all kinds and home-butchered meat just lying spread out on a board. It seems so alien to us, all used to our supermarket pristine, wrapped meats or in an organic butcher’s shop. 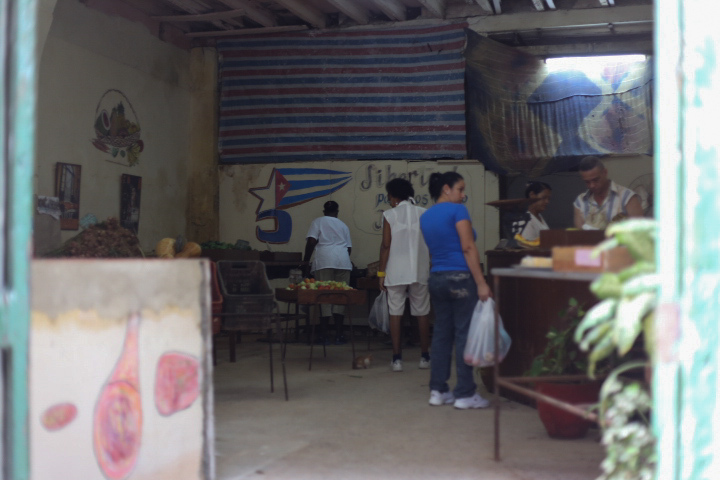 Most produce in Cuba is sold in this way, even in the towns the shops are very basic, mostly without refrigeration. 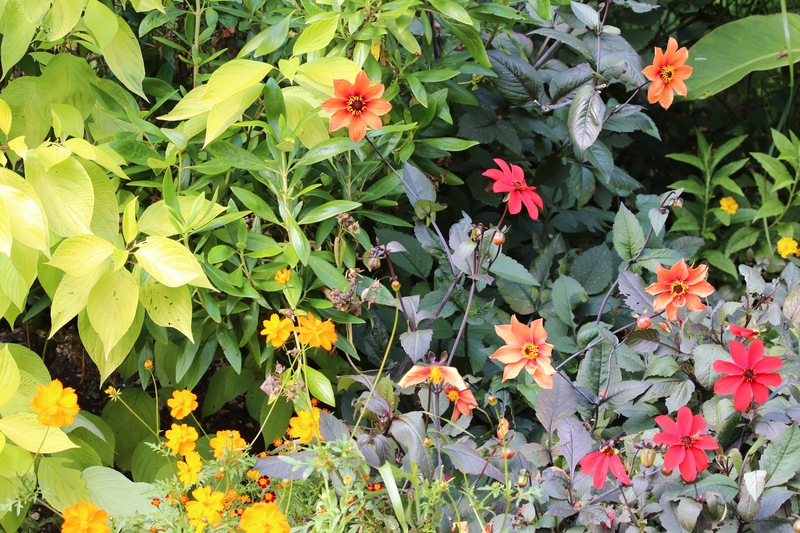 Of course that means that as only small quantities are available each day, everything is truly fresh. 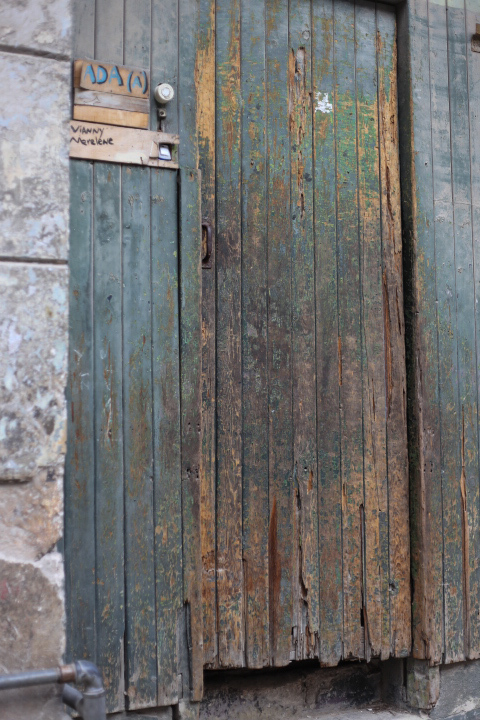 Why bother to paint a door when it looks as interesting as this one and still does its job. Ada in flat A has great style. 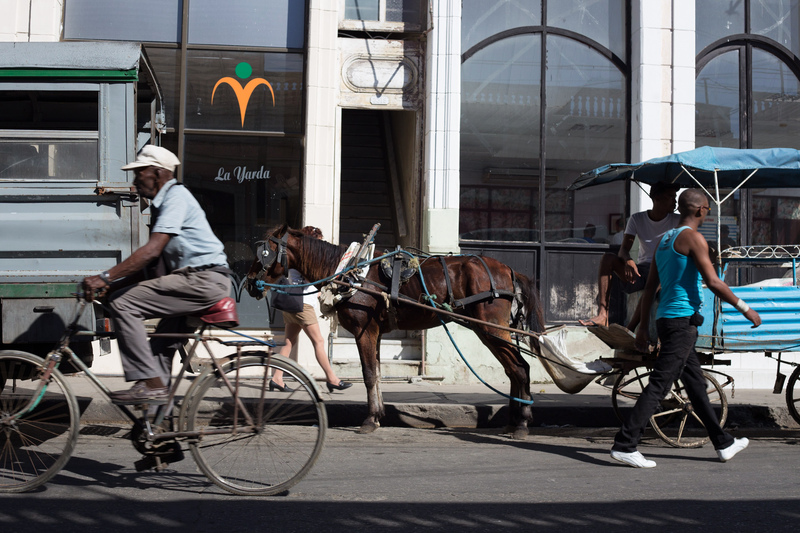 There is a real divide between products for sale to Cubans and those for tourists, even separate currencies, the Cuban shops are sparse and dark with only whatever happens to be available that day for sale. 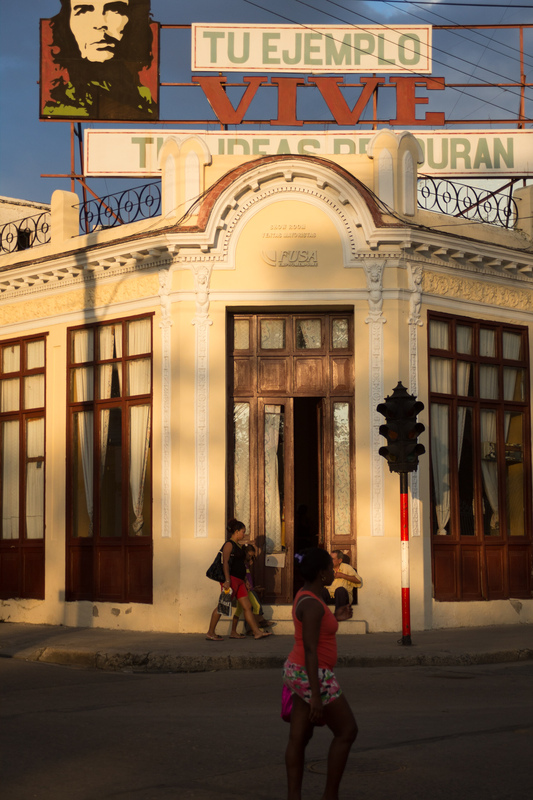 These shops are not for tourists, there are dual currencies inCuba, the Cuban Peso for locals and the Convertible Pesos for tourists, (CUC) There are 25 pesos too one CUC, £1 will buy you around 1.5 CUC. 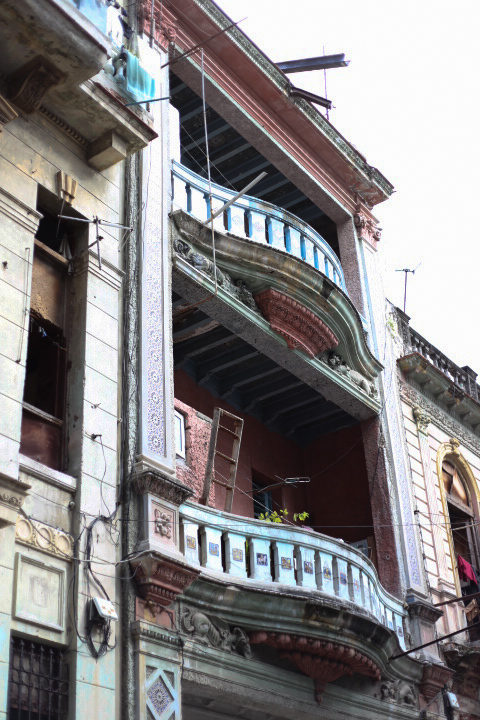 Havana has been immensely wealthy at various times in the past, here is sad evidence of grand colonnial architecture suffering from neglect. 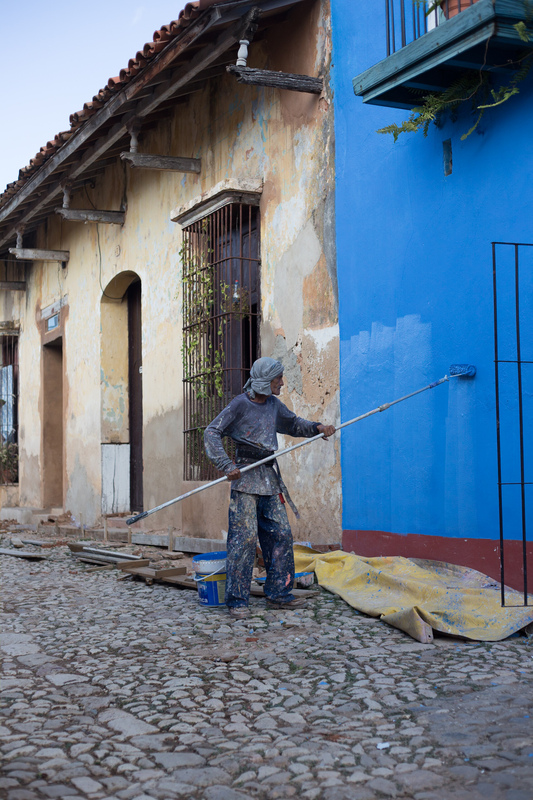 Streets artists draw their surroundings for tourists and ask just a few pesos for their work. 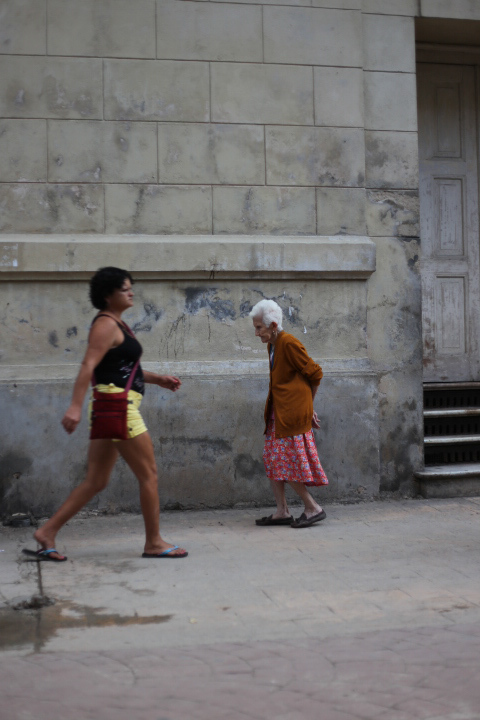 Women dress up in more-or-less traditional colourful costumes and parade around often with a large cigar in their mouths, hoping that tourists will offer them a few pesos to take their photos. 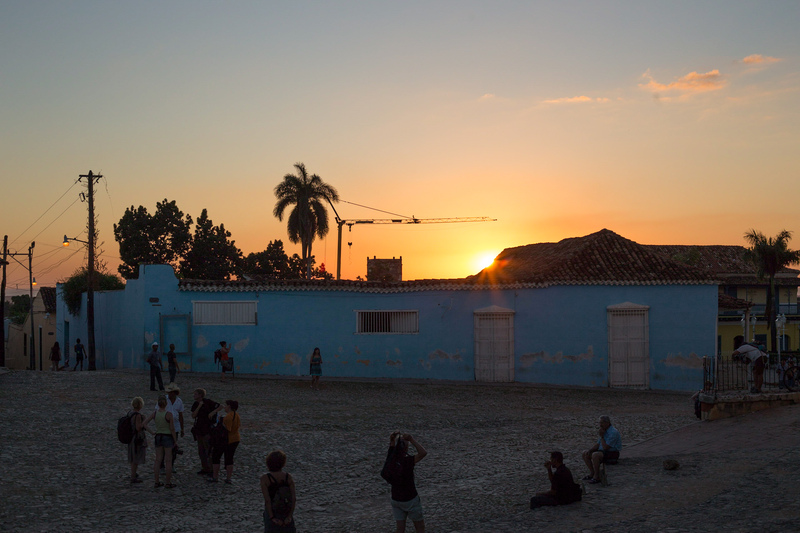 Revolution Square, a vast empty square – plenty of space for the tourist coaches in high season. 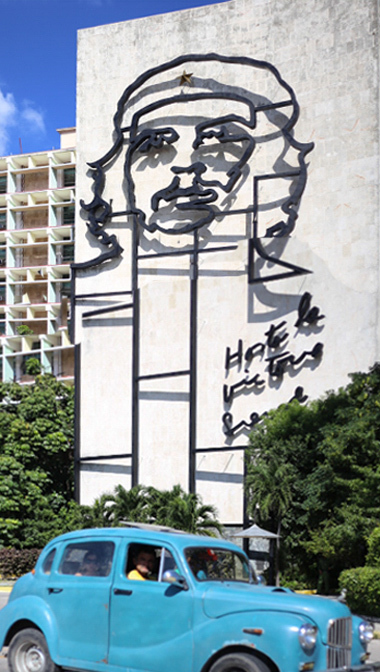 The vintage cars chase each other around the square, showing off their shiny curves in front of the iconic face of Che Guevera keeping lookout above. 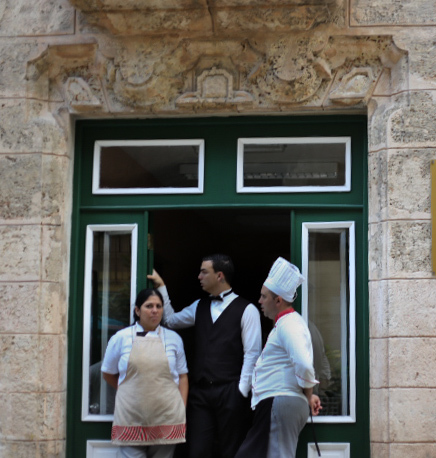 These restaurant workers have come outside for a well-deserved breath of fresh air, the two men are oblivious but the woman is understandably unhappy that I am taking their photograph, though I had tried to be inconspicuous, shooting from the hip. She’s too canny for that to have passed her by. 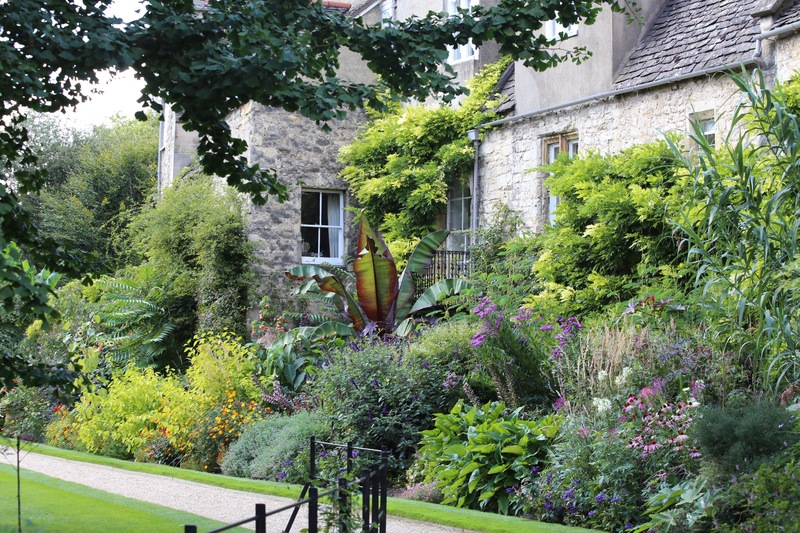 Every house has grilles over the windows, often intricate and delicate-looking designs. The windows are rarely glazed but have internal wooden shutters. Here the metal bars have been adapted to fit the space to be secured. Frequently there are door sections too and even space cut out for air conditioners. Vintage cars are highly prized possessions passed down through 3 generations. 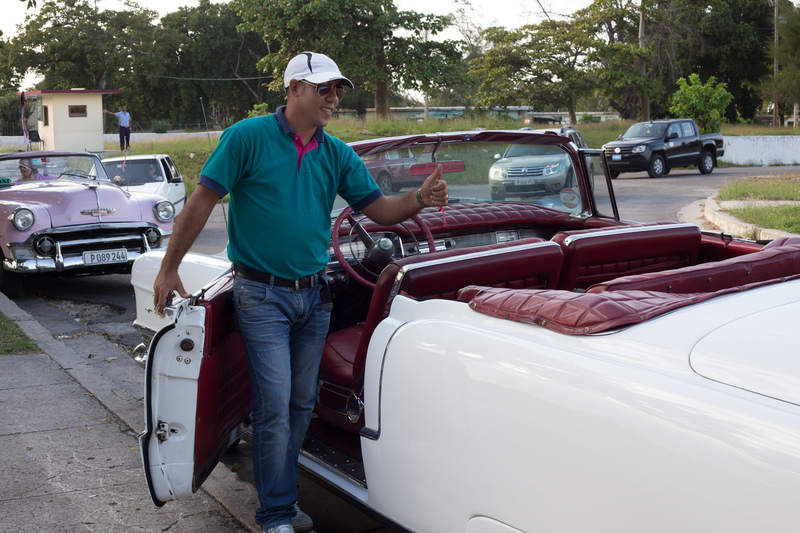 Emilio runs his grandfather’s car, bought new in the 50’s as a taxi/sightseeing service, he says its a nightmare to keep it on the road, its so hard to get parts but the body and upholstery he keeps in good condition. The petrol consumption is huge, hence the prices the tourists must pay, though a half hour trip is still a bargain compared to London fares. 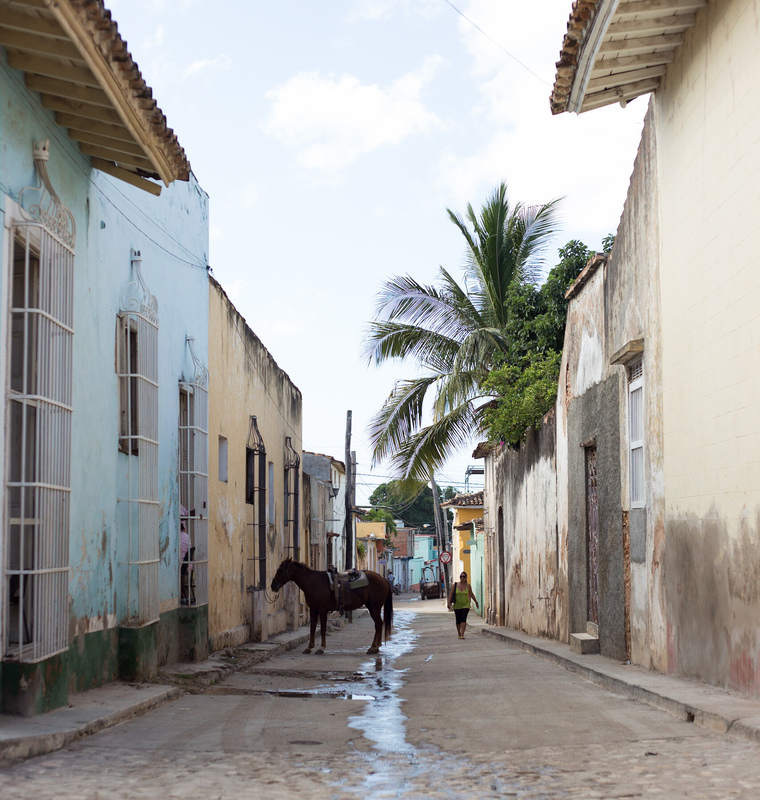 A typical street in old Havana, regeneration is painfully slow, materials abandoned and rusting in the roadway. 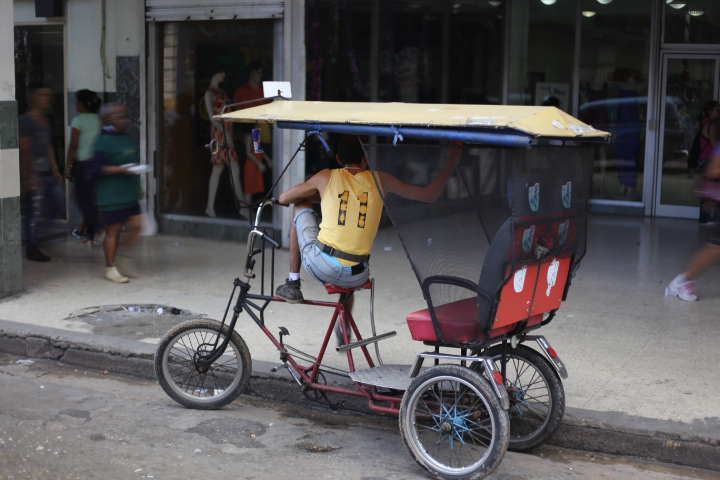 Bicycle taxis abound, ad- hoc constructions made from recycled metal components and topped off with jaunty awnings to protect the passengers from the midday sun. 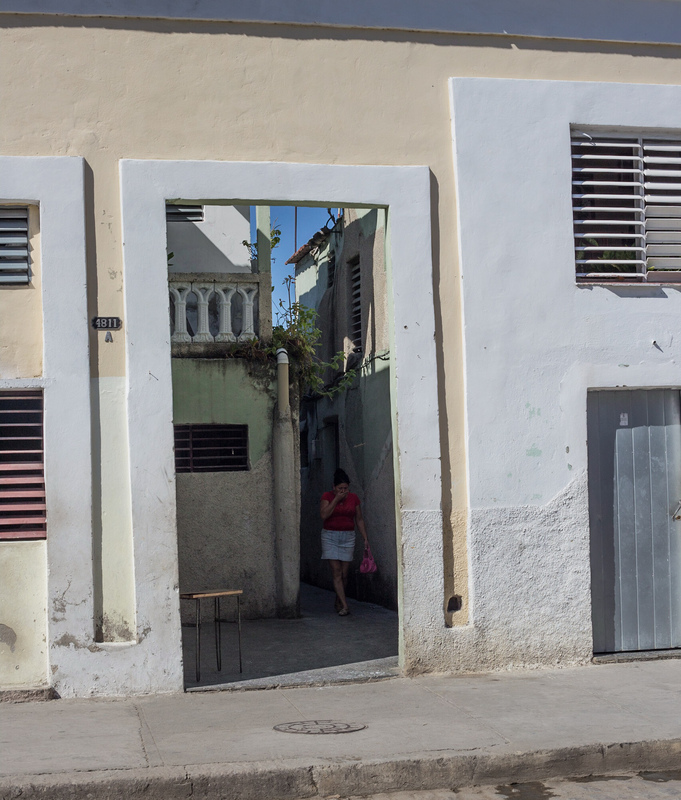 Muh of Havana is built on the pattern of houses in a block built around a central courtyard, here filled with smoke from an open fire. 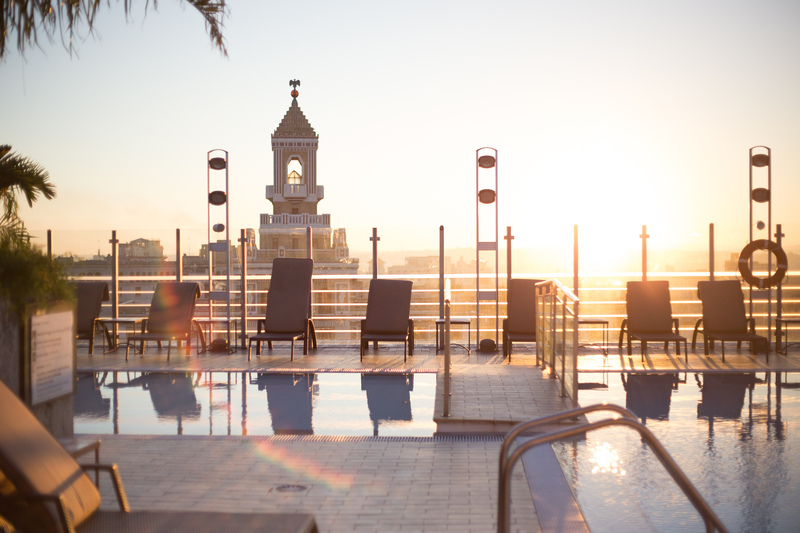 Dawn from the roof-top pool of one of the hotels in central Havana which have been re-vamped for tourists demanding international standards of amenities.There is a vast divide between the sumptuous surroundings on this roof-top and the palpable material poverty in the streets below.